Be sure to read through my counter service reviews from 2013, as well as details from my 2012 and 2011 trip reports, as well. I’m sorry this took me so long to update! And please excuse any errors — I wrote these 8000+ words (this and the counter service) in one jaunt with fingers flowing for the memories! But there are a lot of important things to note this time around. We tried a lot of new (and questionable) updates. I did get sick. 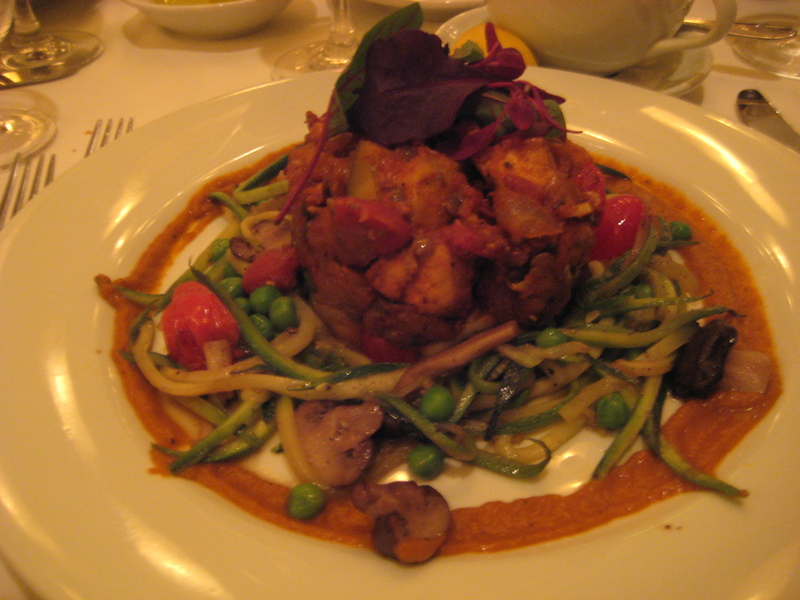 There was an important mislabel on an allergy item, and there were some chef changes and a few fantastic experiences. There was also a very blatant “glutening”, which was frustrating. Like past years, I spoke to all chefs on the phone before I went. These reviews aren’t quite as extensive as past years, as I think there tends to be a lot of repetition as we go through similar restaurants! If you’re finding anything is lacking, check out the old years or send me an email. We have a few goals each time — to go back to our favourites, try something new, and limit our Signature Dining to 3 restaurants maximum. Because we didn’t have Free Dining, though, the latter wasn’t too important. But that aside, a fantastic trip as always! 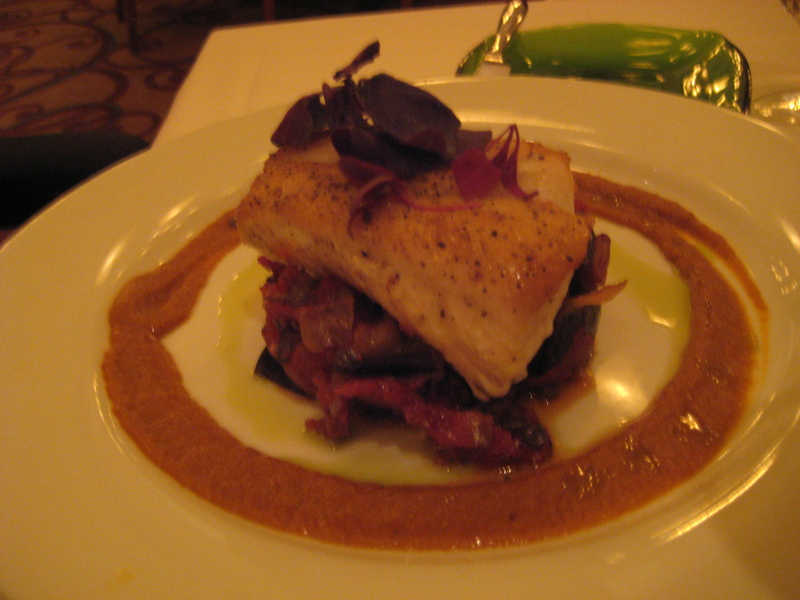 Kona Cafe was a new one for us–we did have a reservation there last year, but cancelled it when I didn’t hear from the chef. 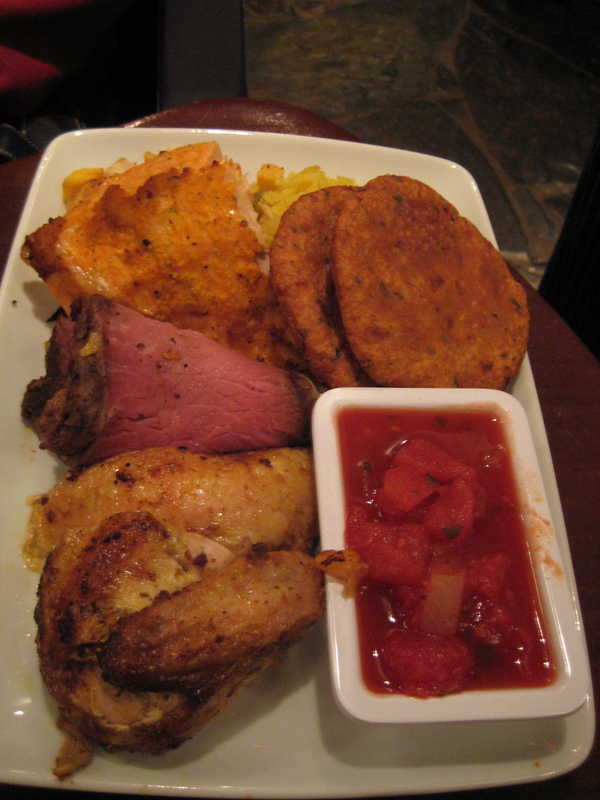 However, we were pretty lucky: because California Grill was closed for refurbishment, we had chefs Kevin and Katrina–both transplanted from there–who were super friendly and open to doing some experimentation. Lighting here was super dim, so the photos are not very good–my apologies! 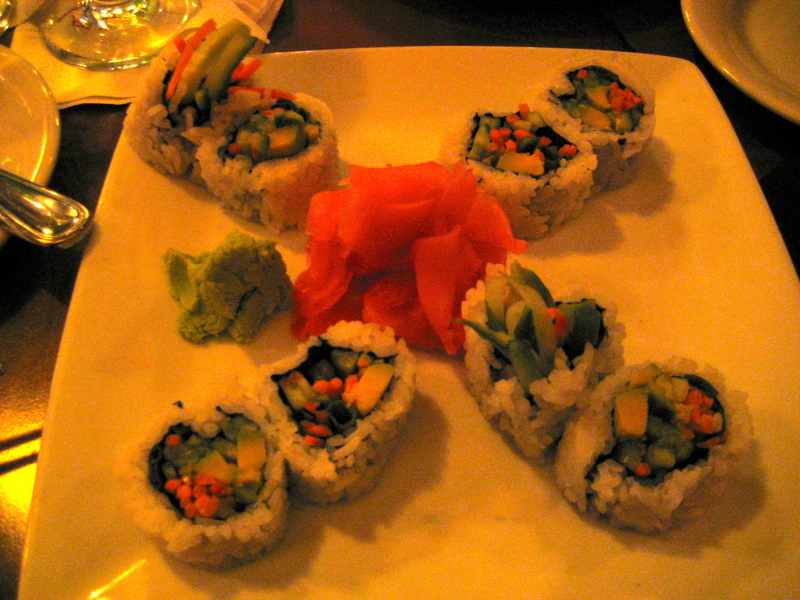 GNI rolls were on tap, and Mom started with the Kona salad. 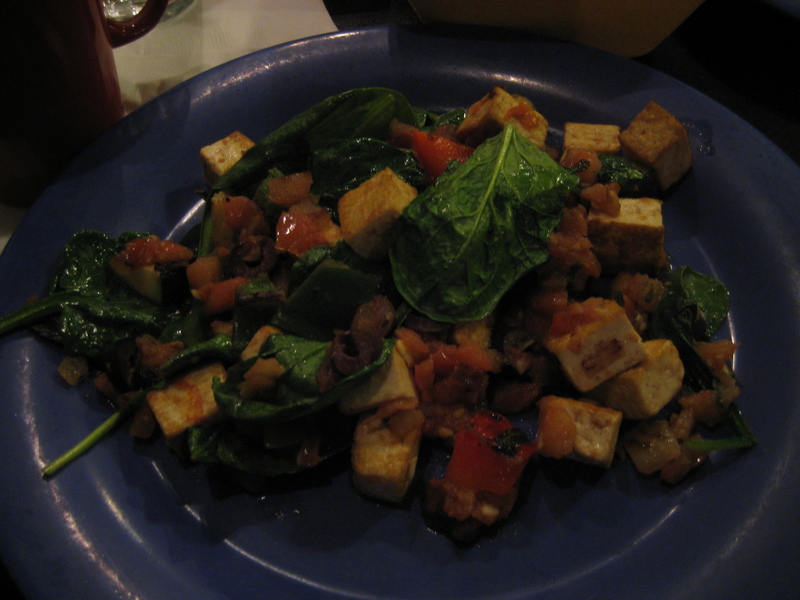 It had greens, red onion, and apples in it, and she had to order it specifically sans soy. And I asked for a vegetable sushi, and Chef Kevin asked if he could “have some fun with the filling”. Of course–just no pineapple. They had San-J gluten-free tamari for a soy sauce substitute. He ended up putting carrot, avocado, green onion, and cucumber in it. 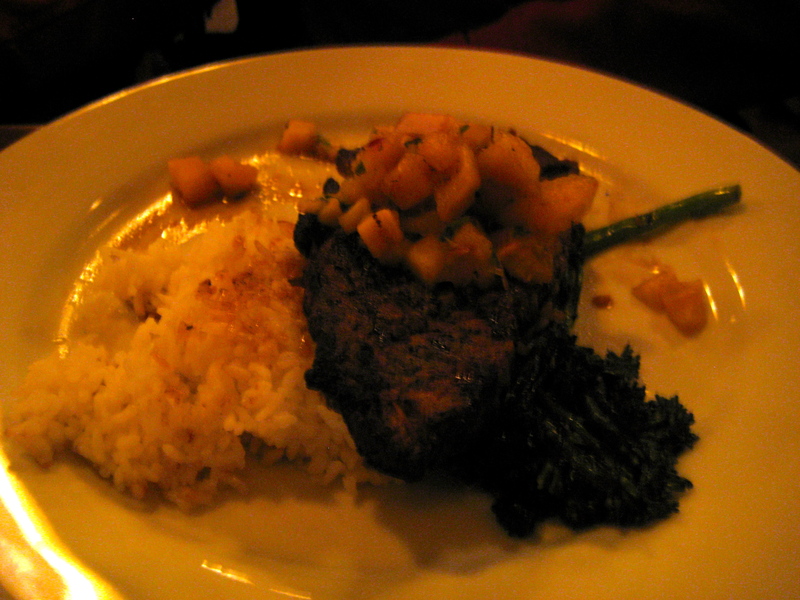 Mom’s main was the steak, which came with broccolini, rice, and a pineapple salsa. She said it was perfectly cooked and one of the best steaks she’s had at Disney. Yes, one of the best steaks she’s had at Disney AT KONA CAFE. Blew my mind, too. We experimented with my dish a bit — I had two HUGE (it was equivalent to a whole block of tofu) pieces of tofu, dusted in cornstarch and fried. It was really good! 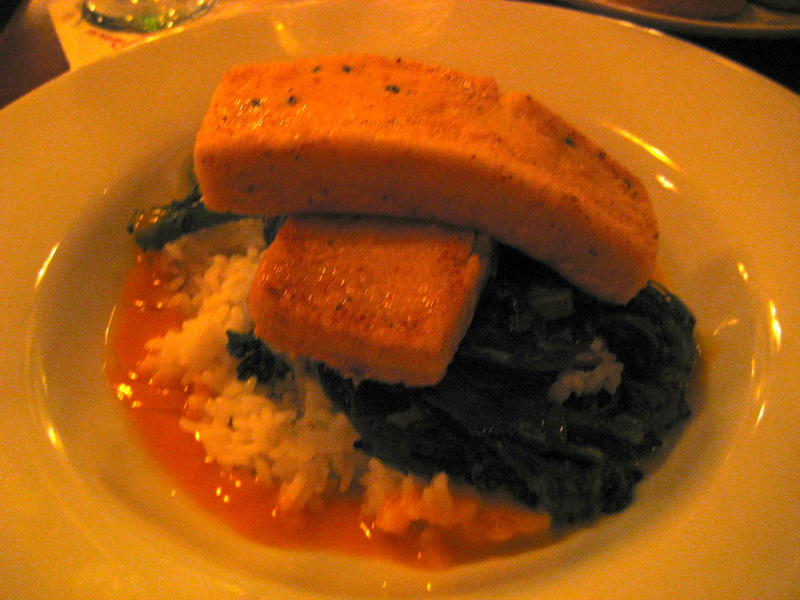 It came with sticky rice (on my request), and swiss chard and broccoli with mango puree. In general, I don’t love mangos, but it was really good here, offsetting the saltiness of the tofu and the tamari that was in the greens. Dessert included two (soft!) 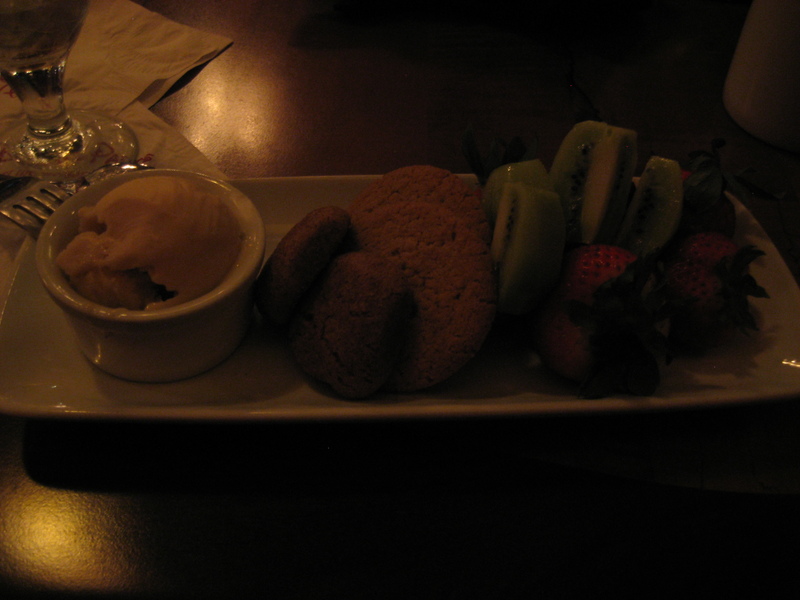 Enjoy Life gingerbread, 2 crunchy vanilla, and kiwi, strawberries, and some Rice Dream ice cream. I would definitely go back here, though I’ve never been when their normal roster of chefs are on, so I am not sure they would have been as amazing! Like every year, Beaches and Cream is a post-race tradition. And, like every year, we get the same things. This year, they had crushed peanuts, and I decided to try the strawberry sauce and chocolate sauce. 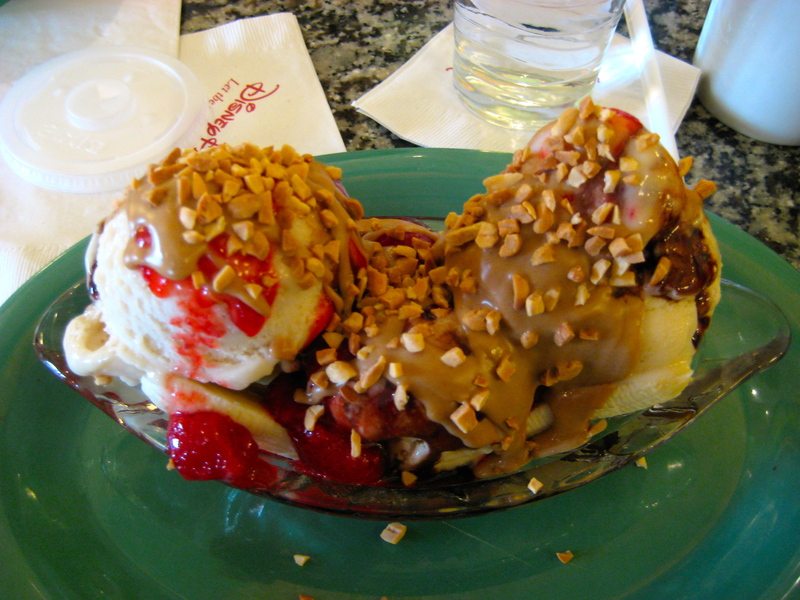 Next time, I’ll stick to just the bananas, peanut butter, and ice cream (and those peanuts). 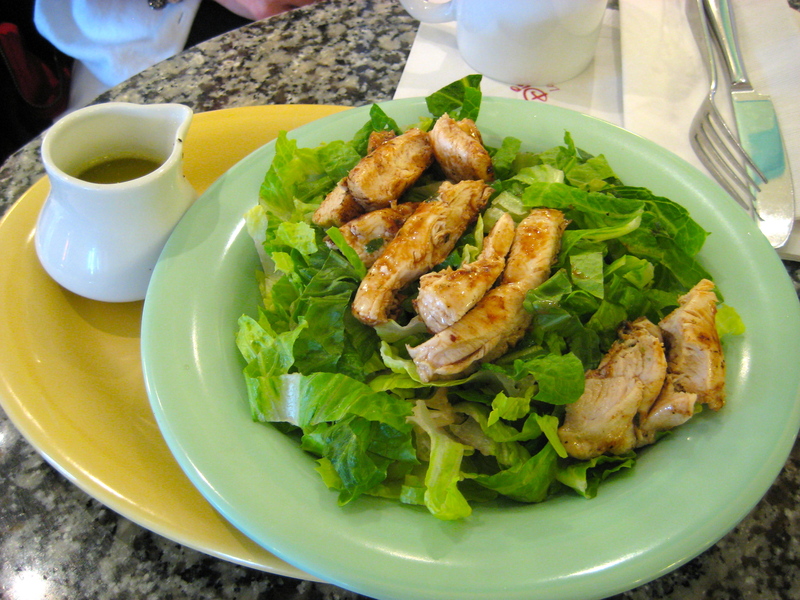 Mom’s salad is a safe version of the chicken caeser: basically chicken with lemon, olive oil, and romaine. But she says it is amazing chicken. Our server got the manager, who was Kent–super nice and helpful. 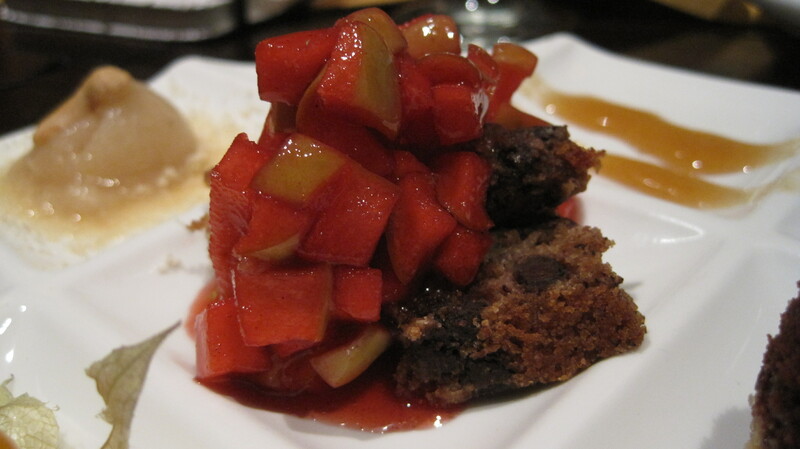 One day they will make me a gluten-free vegan Kitchen Sink… one day. And… another tradition. Monday, day after the race, Boma brunch. Our server was Theresa, and our Chef was Chris. I started with a club soda to drink, and Mom opted for coffee. 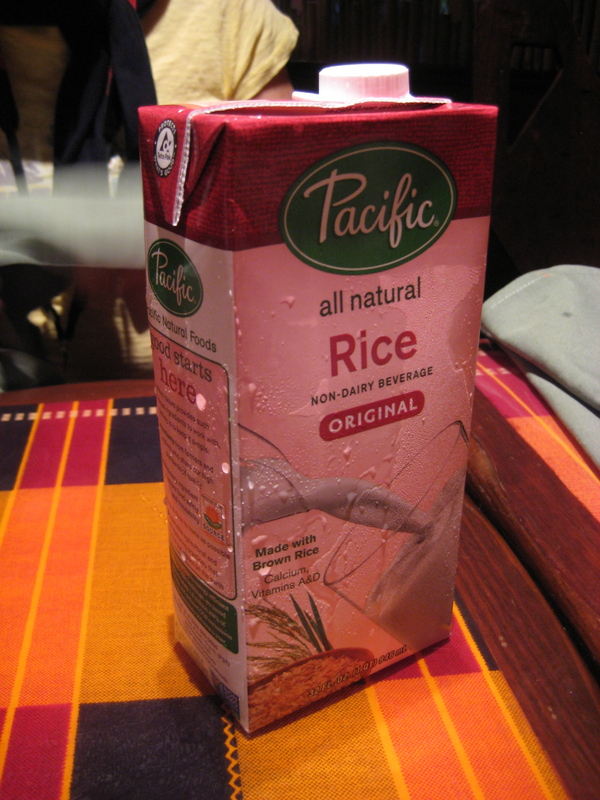 Mom was pleased to hear they had Pacific Rice Milk: the only safe option for her for milk in Disney, and they seldom have it places. So that went in her coffee (more on this later). 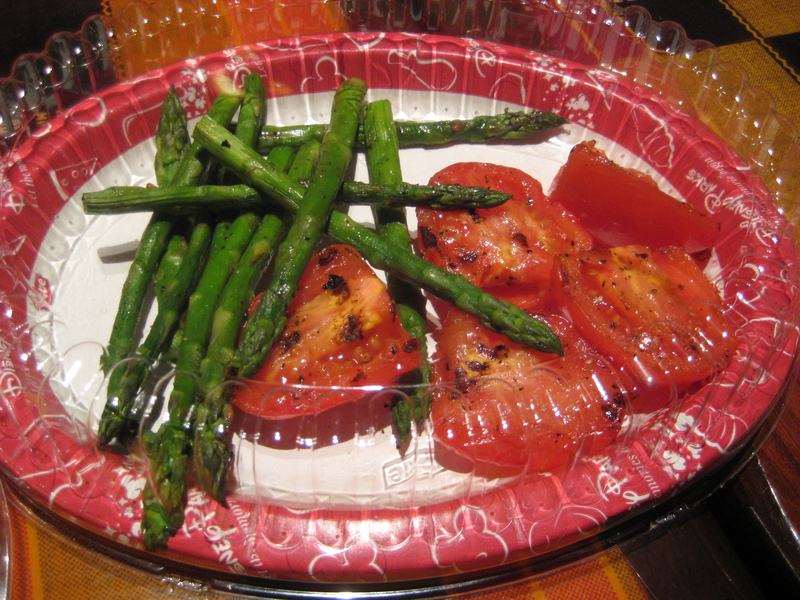 From there, we got a few things that were on the buffet (but from the back): the fire-grilled asparagus and tomatoes, chakalaka (oh, how I love it), and a huge fruit platter. 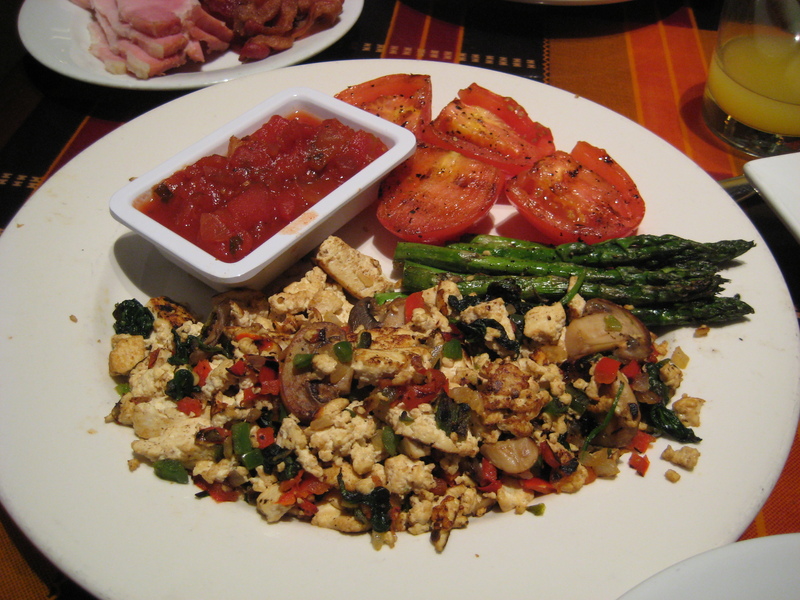 Chef Chris made me a tofu scramble, too. 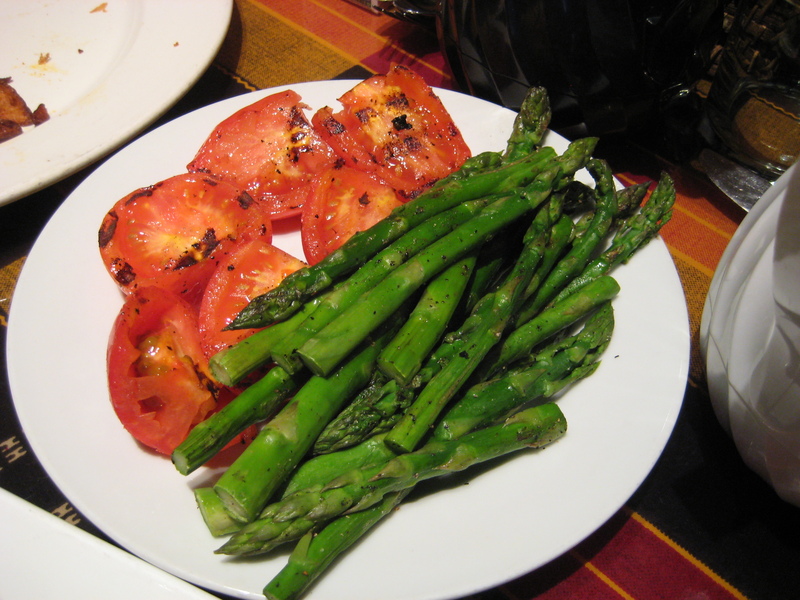 More tomatoes and asparagus, for Mom (and I ate more because they are that good). 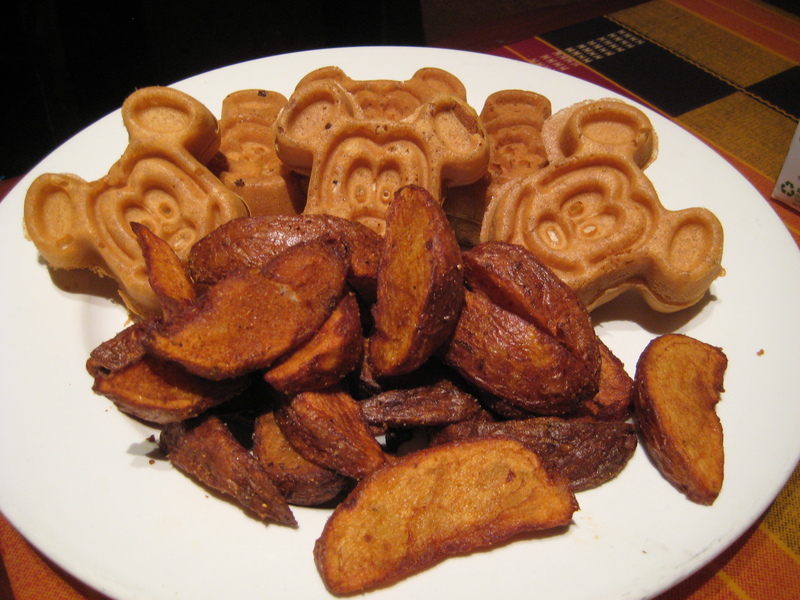 Allergy-free Mickey waffles and the best, best potatoes (yes, I do love these potatoes). 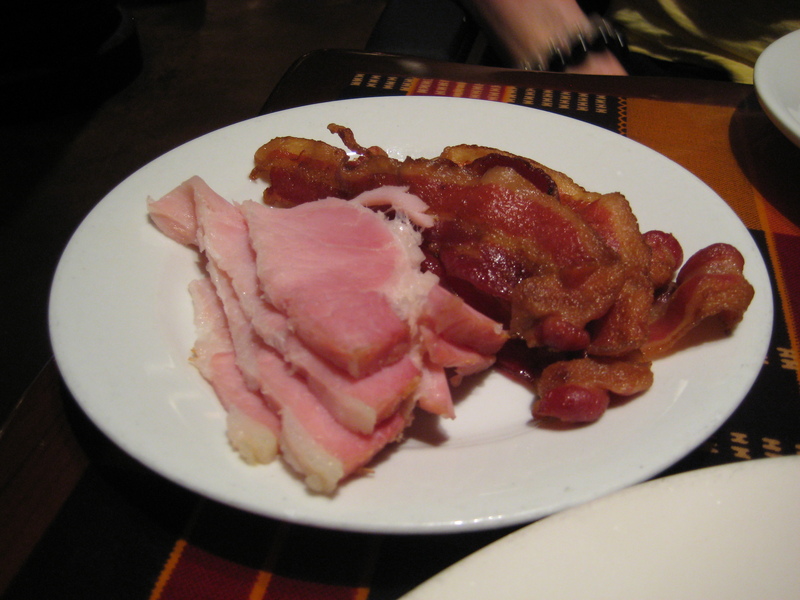 A plate of meat for Mom: ham, bacon. They have breakfast sausage, too, but she isn’t a fan of it (in general, not just Disney’s). So we are about to leave and Chef Chris comes out and says that there is no point of it going to waste: did we want to take home the leftovers? (Of course we said sure). Having been so pleased to hear they had Rice Dream, Chef Chris came out and insisted that we take back the carton for Mom to have during the trip. How nice was that? The carton was literally full other than what Mom had used. There were 16 cookies in there! 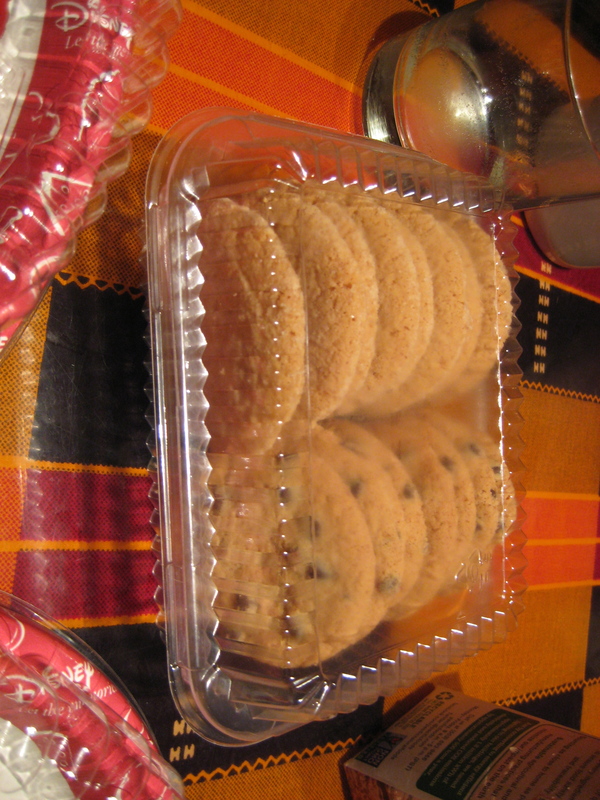 Enjoy Life Chocolate Chip and Sugar Cookies. 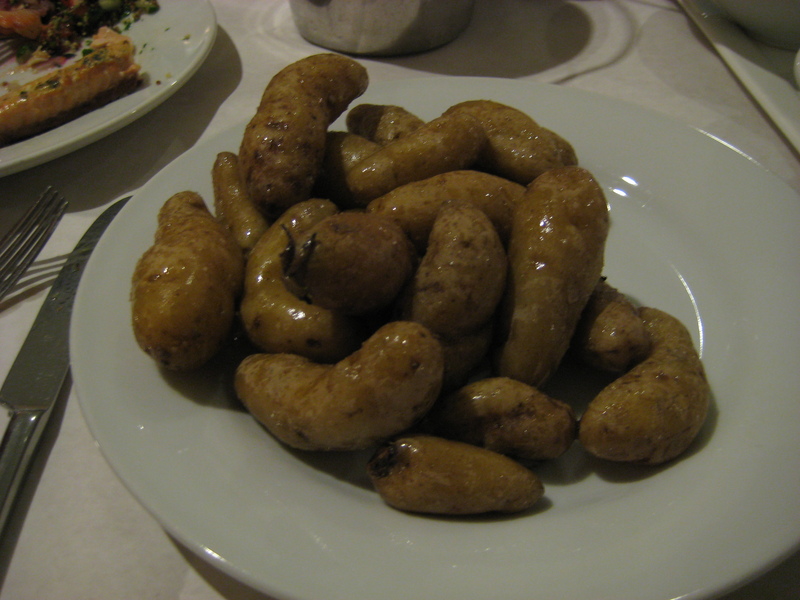 Though I’m not a fan of the crunchy ones, they were good to have over the trip, anyway. How nice are some of these chefs?! We booked Be Our Guest for the experience, really, and to try it once. After going, we realize: yes, it is about the experience and trying it once. Mom started with the Odwalla lemonade (minus the fancy foam that came with it, since we weren’t sure if it had soy). I had Perrier since they didn’t have club soda. 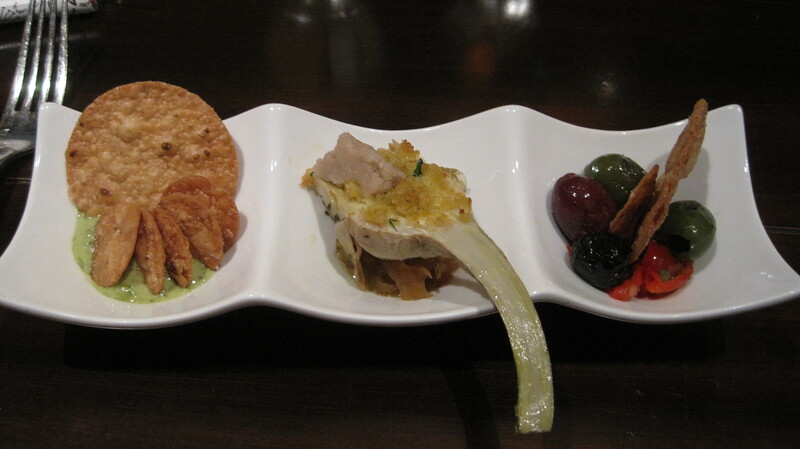 To start, we both got the salad trio, and they had Ener-G rolls as the bread. Our chef was Rafa (who had emailed me multiple times) and our server was JoAnn. You know, the idea of the salad trio sounded lovely. 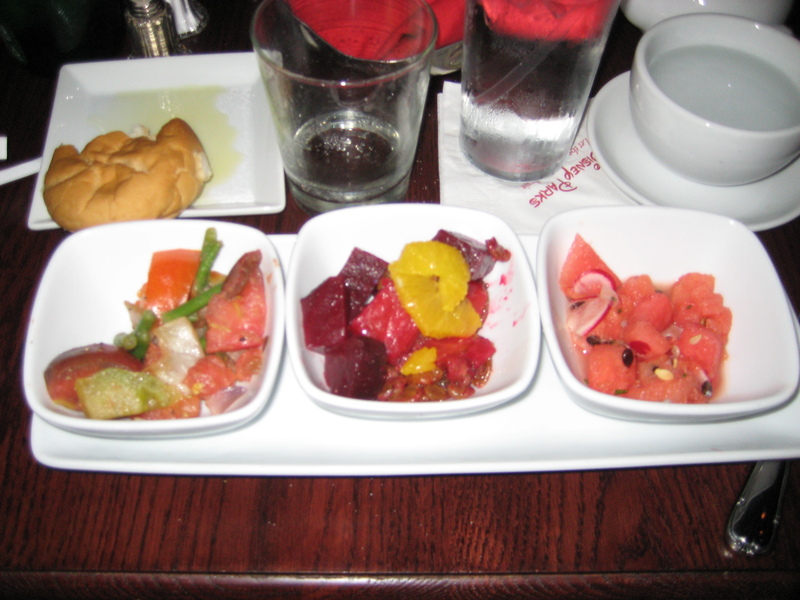 From left, a Green Been, Tomato and Roasted Shallot Salad; then the Roasted Beet, Golden Raisin and Orange Salad; then the Watermelon, Radish, and Mint salad. I love salad, but only when the ingredients are, well, fresh. These all weren’t. The first one tasted just like raw shallots and nothing else. The middle salad was really good. The watermelon was mealy in the third. It was a little disappointing in the way that, if something isn’t fresh, why not just use something else? 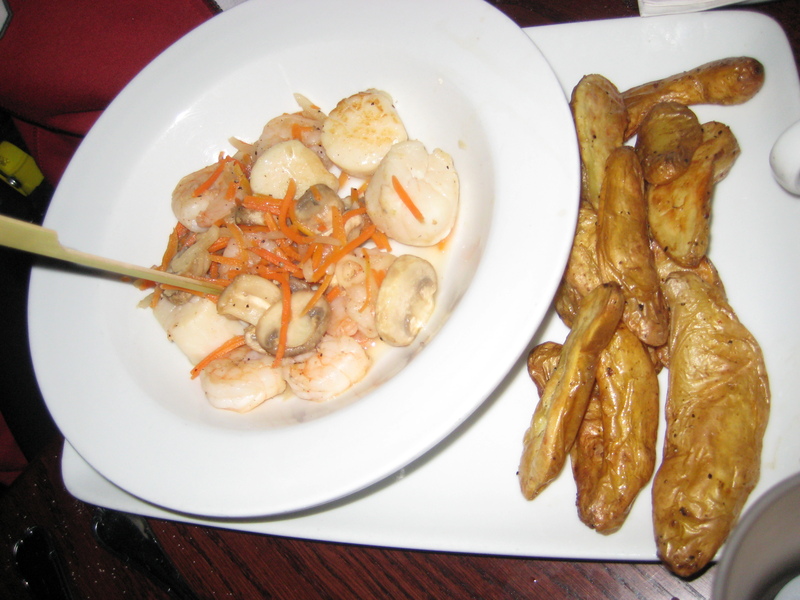 For dinner, Mom’s had to be changed up a bit, and she had a scallop, shrimp, and roasted potatoes. 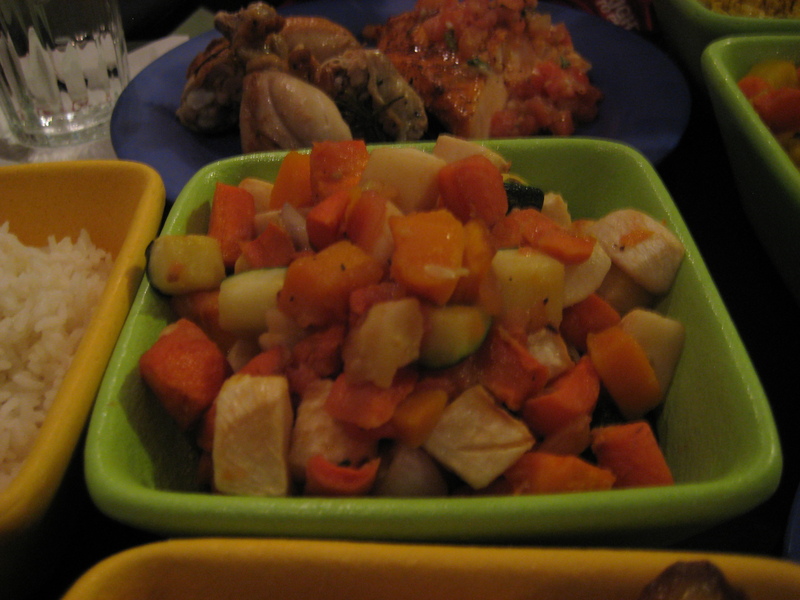 The shellfish included a mushroom, carrot, and onion mixture. 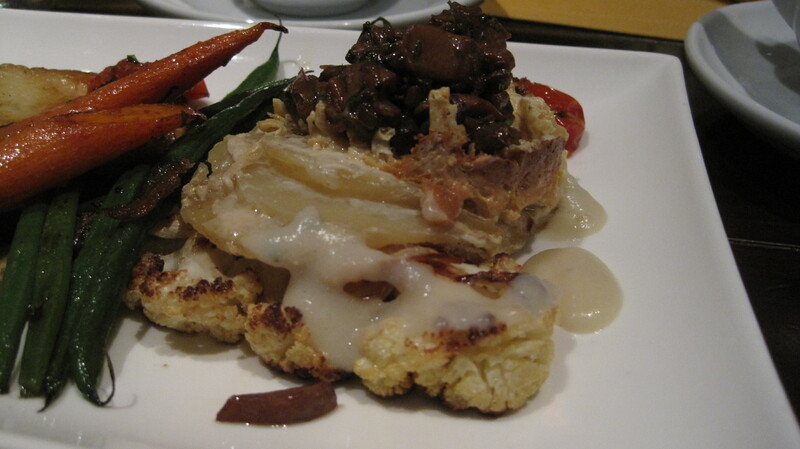 It was a version of one on the menu that generally is served with puff pastry and a cream sauce. I think that the chef really had no idea what to do. 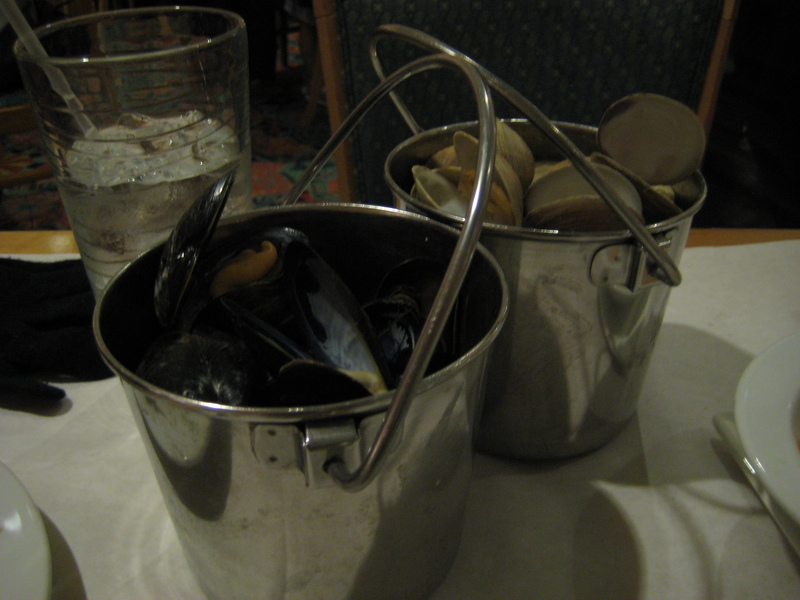 Mine was good — I had the ratatouille (which is on the actual menu), and they didn’t have to change it at all. But the portion was really, really small. And you likely see from here that I eat a lot, but honestly, I could have eaten a whole second (third? fourth?) serving of it. They had lemon and strawberry cupcakes for dessert (not Babycakes)… you might want to pass. Mom wouldn’t eat hers (she isn’t picky), and I ate the cake part, the the icing was very shortening-based and not the greatest. Man, I sound like a downer! But really, at the time, they didn’t have allergy-friendly down quite yet. I also think that it’s likely all about the experience. And they were really new at this point. We went to Jiko our first year, but not the second, mostly because their menu was still the same. We had Chef Michael, and our server was Dawn. 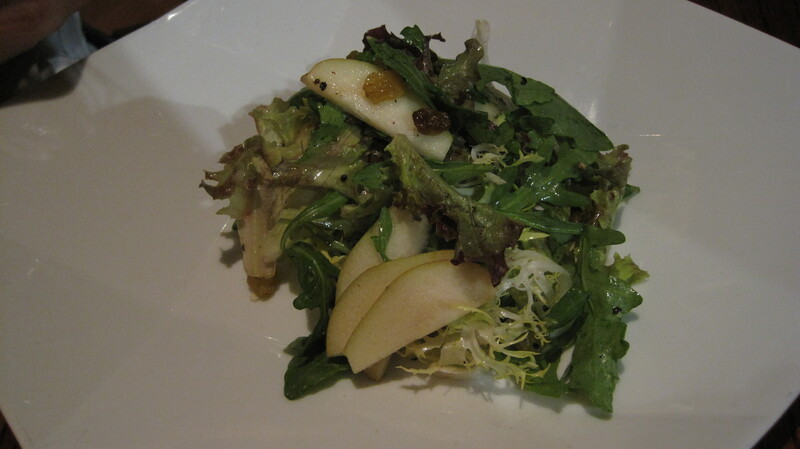 Along with pappadum, we both got the Jiko salad to start, which had forelle pears, caramelized raisins, and a citrus vinaigrette. 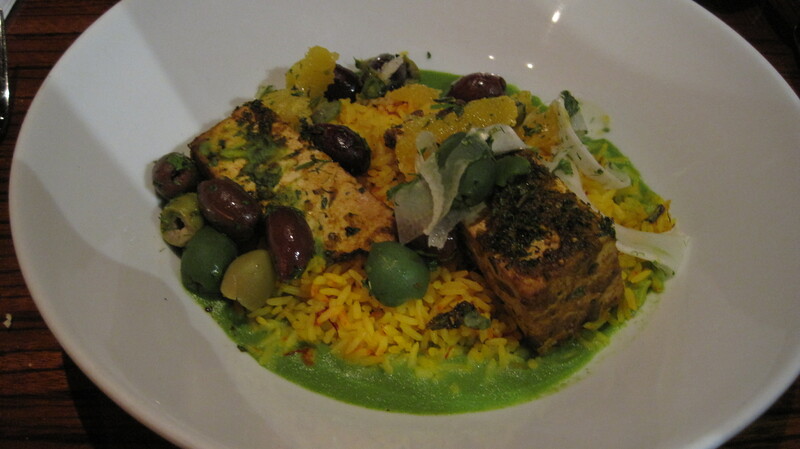 For my main dish, I ordered the Chermoula Tofu, which came with an English Pea Nage, Saffron Rice, and an Orange and Olive Salad. Super flavorful. I really enjoyed it. 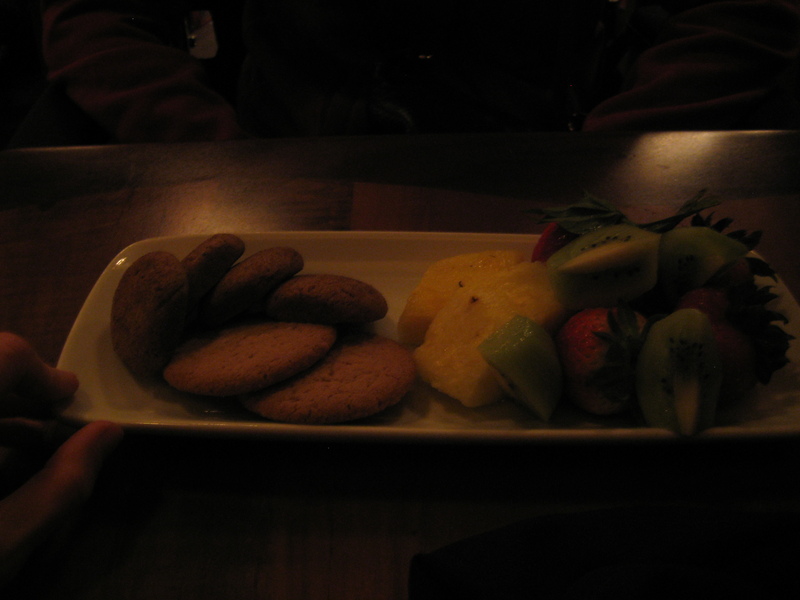 For dessert, they had sorbet and Enjoy Life cookies. 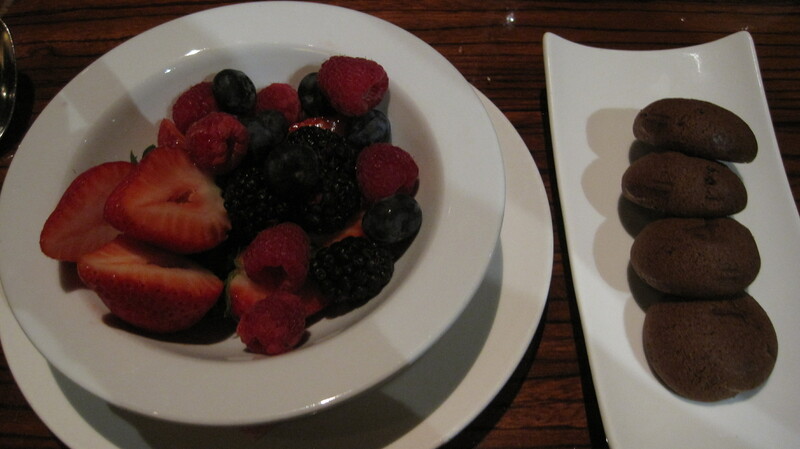 I don’t love sorbet, so Chef Michael put together a fruit bowl for me (with Double Chocolate Cookies, yes, soft ones! 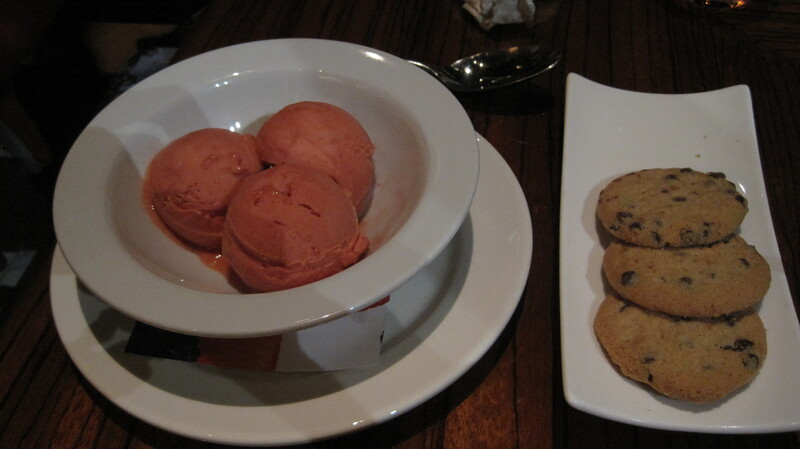 ), and Mom had the strawberry sorbet with Enjoy Life chocolate chip cookies (crunchy). Which worked out great, since she loves the crunchy ones and I love the soft ones. I like Jiko, and think it is really good, but if you are on the dining plan, I really don’t think it is worth a signature credit, especially if you’re vegan. If you do want to eat here, I would opt to pay this one out of pocket. I wanted to go here for one reason: bottomless milkshakes. Our server was Suzan, and Chef Ken helped us out. We wanted the platters, even though it isn’t remotely vegan. 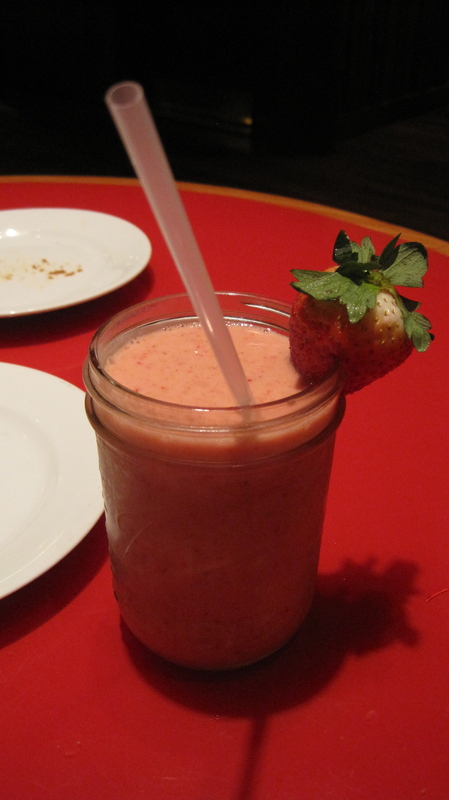 To drink, I ordered a strawberry milkshake (made with Rice Dream), and Mom had a Perrier. That might be my third one. 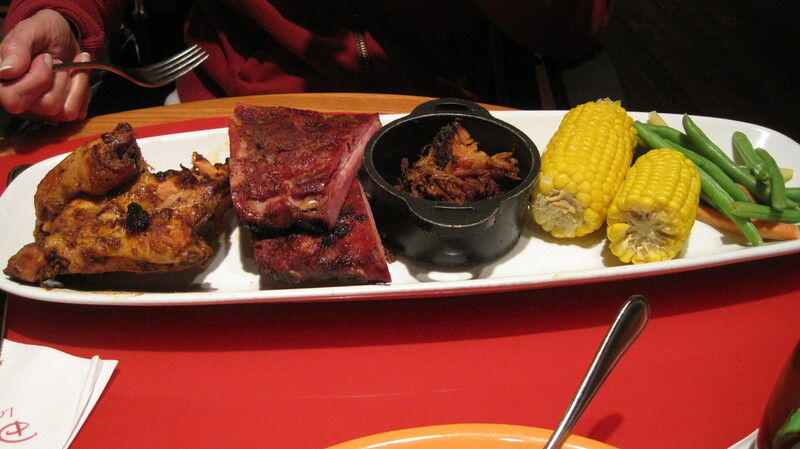 Mom’s platter included pulled pork, herb-crusted chicken, BBQ pork ribs, beans and caorrts, corn, and potatoes. 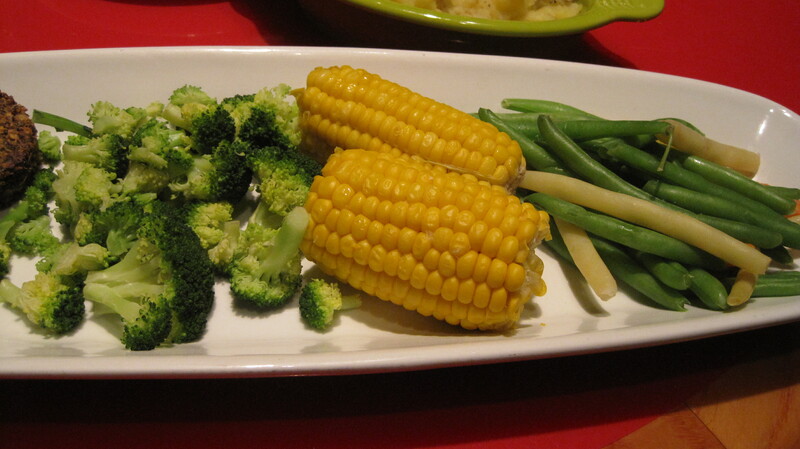 Mine included steamed broccoli, corn, green beans, and the vegan entree which are quinoa cakes with a red pepper coulis. 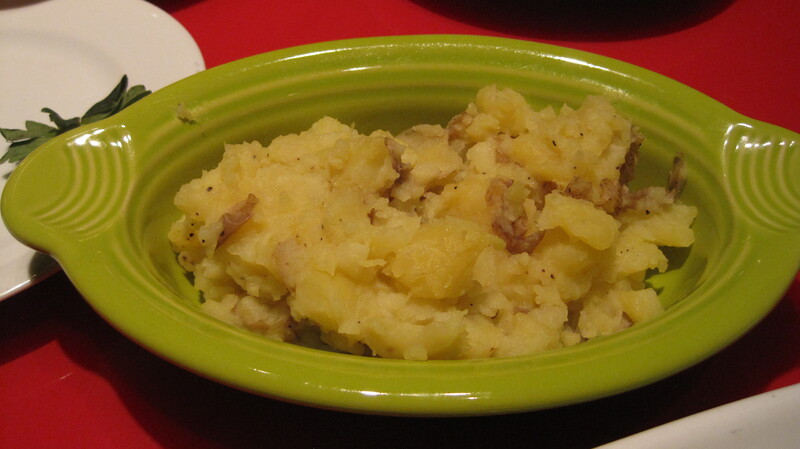 I also had mashed potatoes with olive oil. 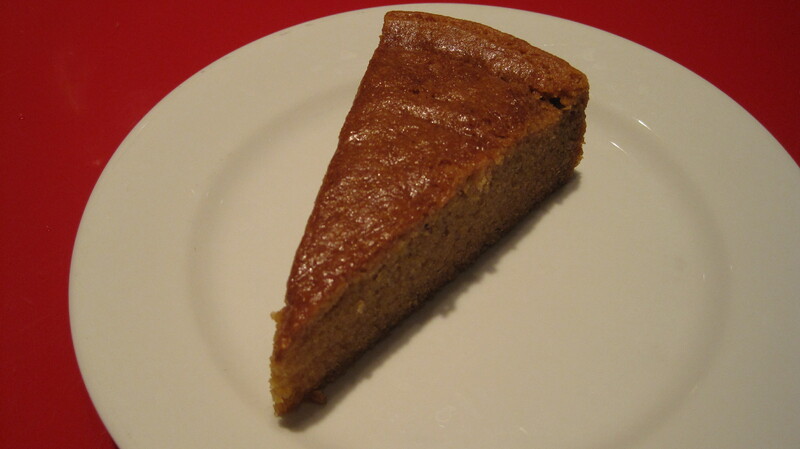 At WCC, they also serve cornbread, and here, they make a gluten-free version using Namaste’s vanilla cake mix. 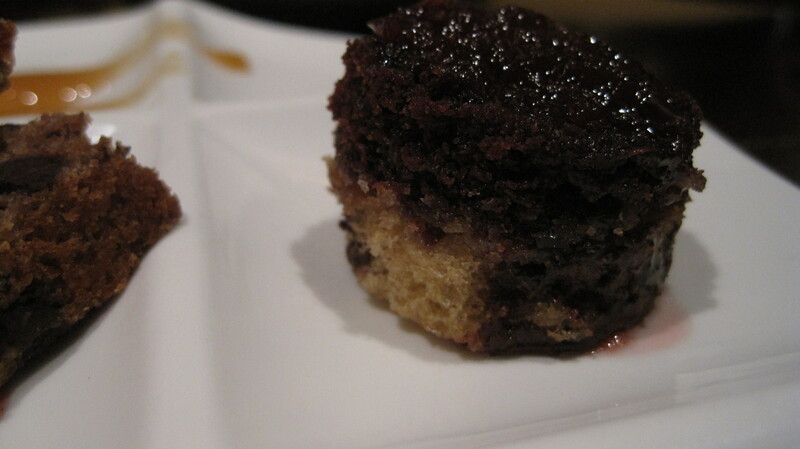 So really, it tasted like cake–it was super rich! I’m not sure if they offer dessert (other than Rice Dream), but we were stuffed (we got seconds of a lot of the vegetables). And I had a whole bunch of milkshakes, too. The best part was that this was one of the coldest days and we were seated right beside the fire! Gosh, I love my mom. I can just picture us here and, well, I love her so much! One last thing: it was near the end of his shift and Chef Ken came and sat down and chatted with us for awhile. He talked about loving his job, where else he has worked at Disney, et cetera. He is a super nice guy. It was amazing! 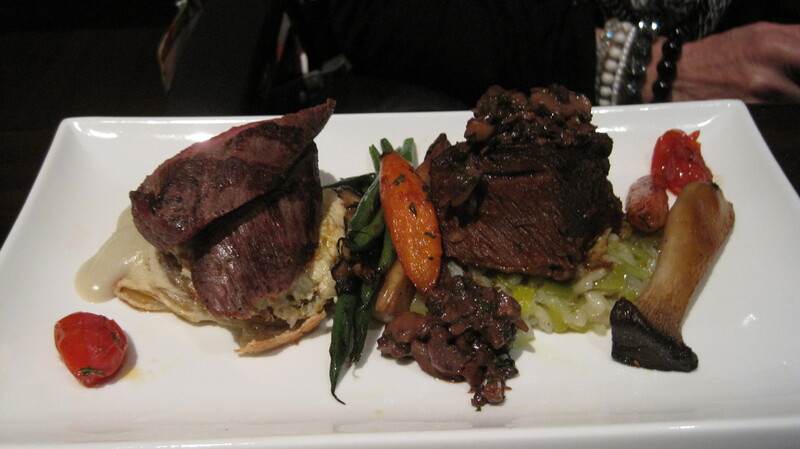 We had a private course-by-course meal in the back room, and… wow! 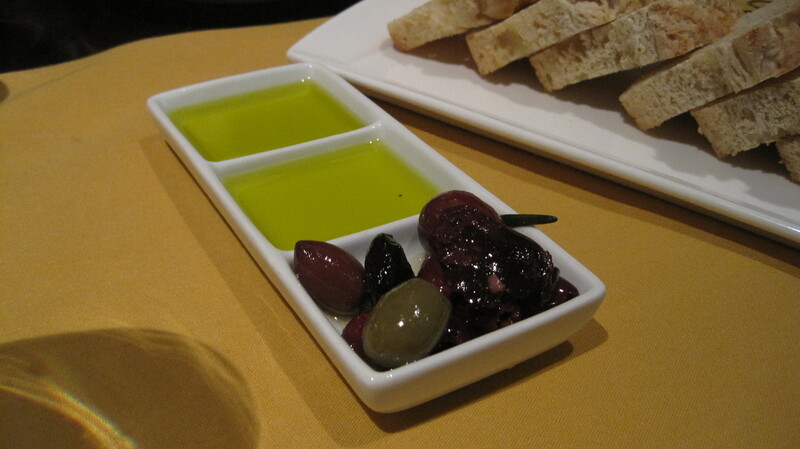 As you already know, Kouzzina is a favourite of ours, we go all the time. If you want the whole play-by-play and are thinking of doing it, feel free to email me. 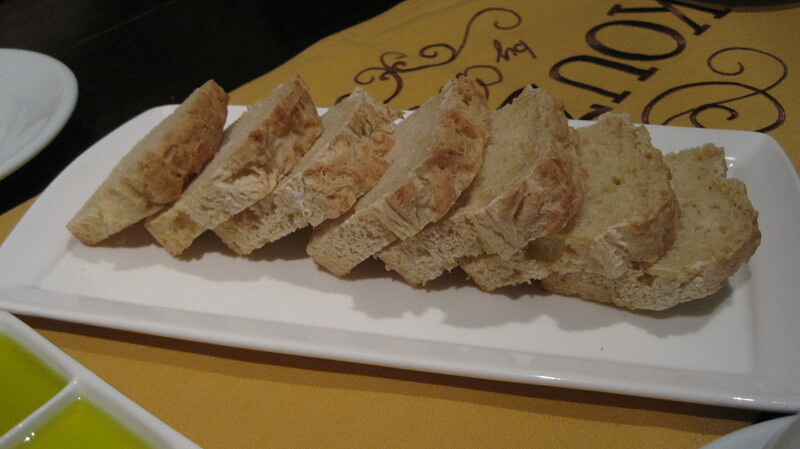 Along with Kouzzina, Citricos is my favourite restaurant, and I am so glad I discovered it last year. I went for one main reason: to get the same main course. As I’ve mentioned a few times in these reviews, it was really, really cold (approximately 6 to 8 degrees) while we were in Disney. In fact, it was colder than it was in home (I live in Southern Ontario), so it was pretty crappy to endure that. Plus, Disney World is a wind tunnel. 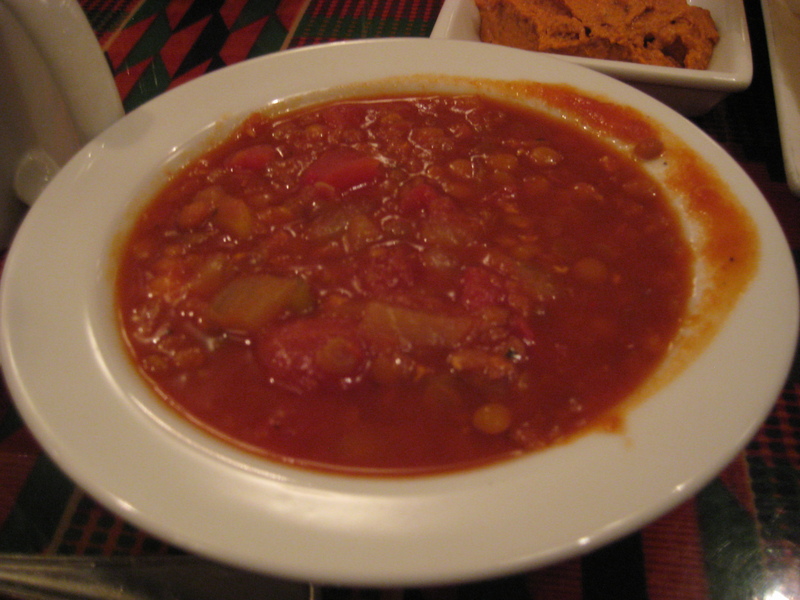 When we got to the restaurant, we wanted something warm, and I mentioned to the chef how I wished the soup was safe for us. 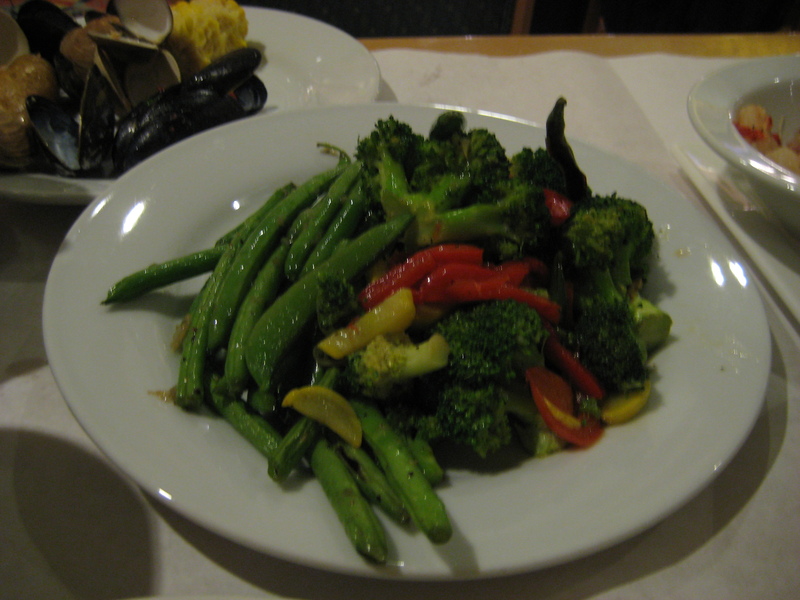 Our interaction with the chef, though, didn’t happen for a bit–we had a server that was pretty standoffish. In fact, other than our experience at Boatwright’s two years ago, I would have to say, hands down, it was the rudest server we’ve had. He really just wasn’t pleasant. Or, having a terrible day. I won’t say his name, but man, he needed some cheer. So, Chef Axel eventually joined us and, turns out, there was no cream involved in the soup (or if there was, they finish it with it), and he could totally adapt it for us. 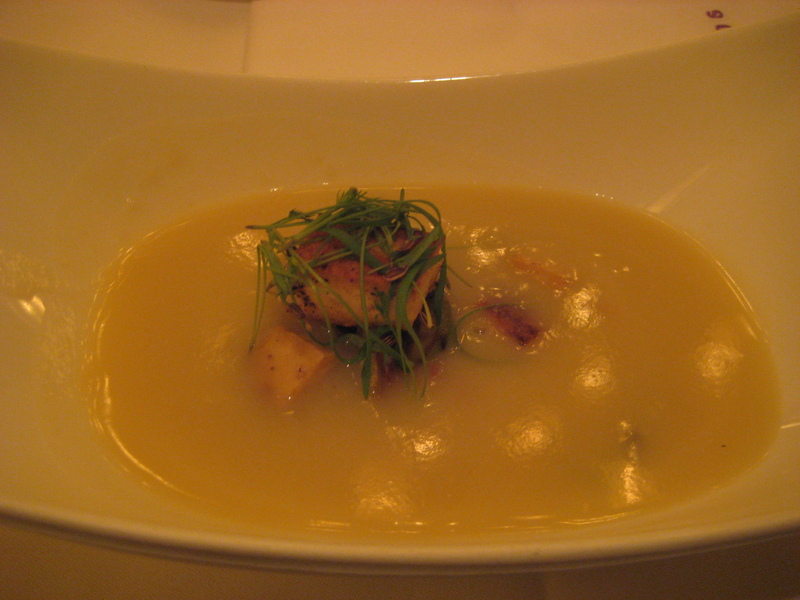 To start, we had a variation on the Winter Root Vegetable Soup that had celeriac, parsnip, and potato puree, with paprika and chorizo smoked scallops, riesling onion, and microfennel. 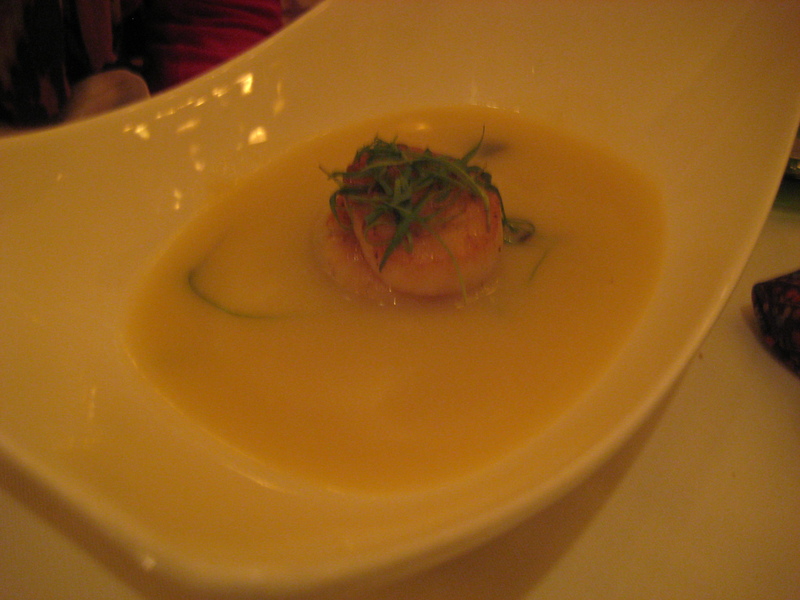 Mom’s included “the best scallop [she’s] ever had”. 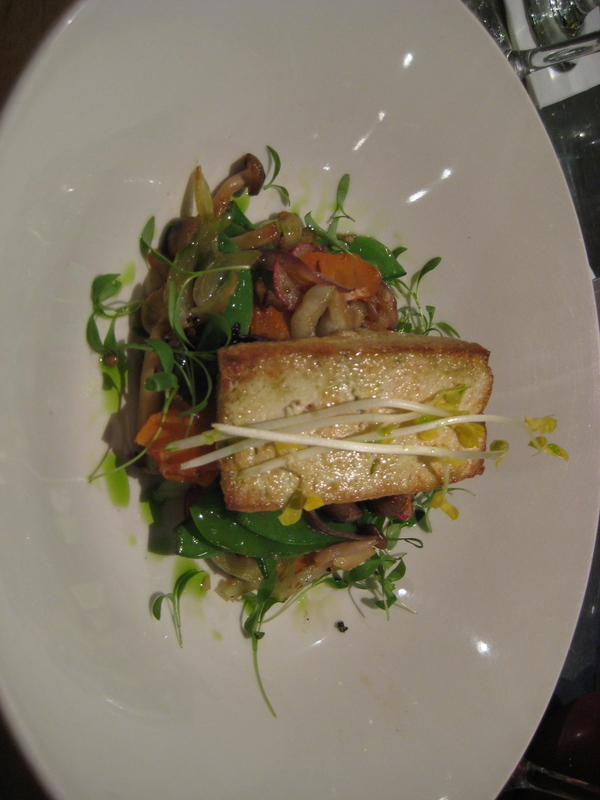 Mine included seared tofu–done to perfection. He also made two crispy Brussels sprouts in lieu of the chorizo. They know tofu here SO WELL. Love it. I had the same main course as last year. 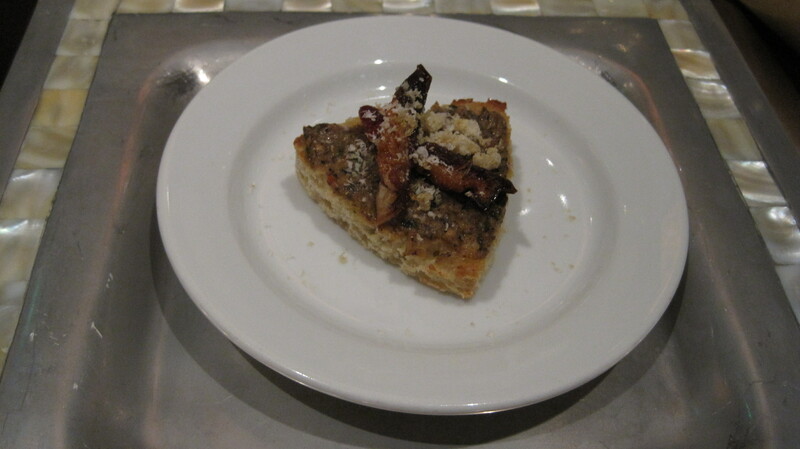 By default, it is completely gluten-free and vegan and so, so good. 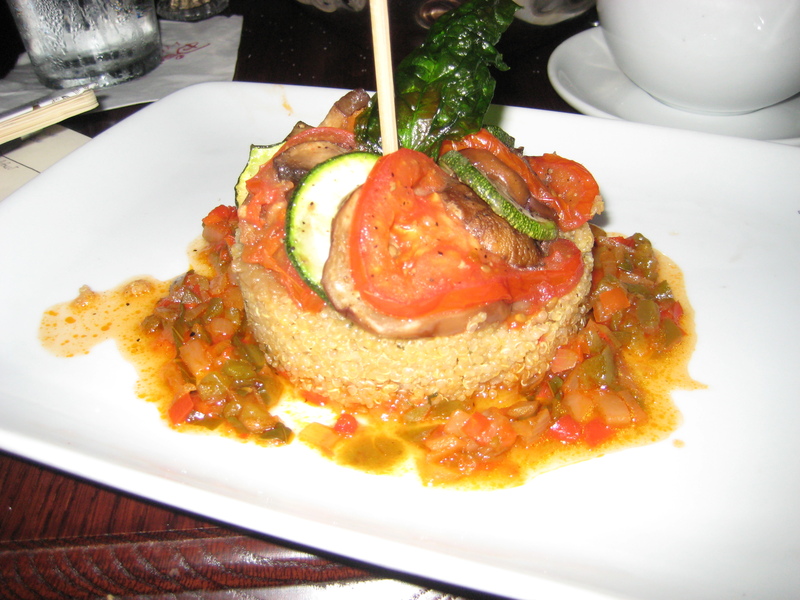 It is seared tofu with zucchini and eggplant ratatouille, roasted mushrooms, lentils, and sundried tomato puree. It comes with zucchini noodles, too. 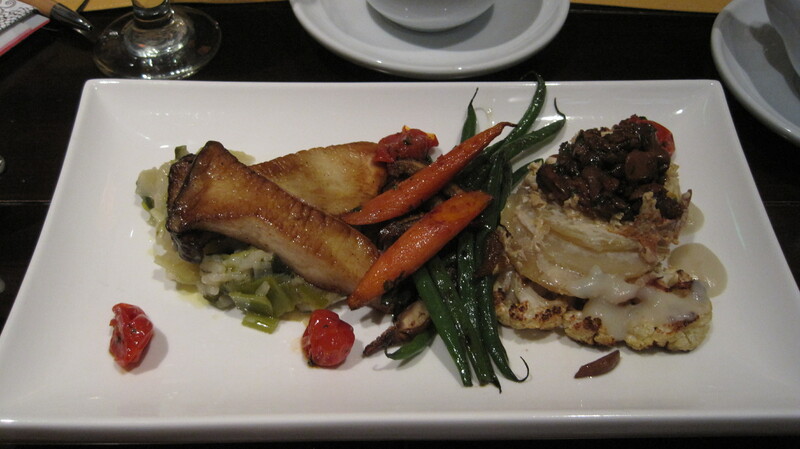 Mom asked Chef Axel for his recommendation, and opted for the pan-seared Florida Black Grouper, which he did on the same lentil topping–basically a version what I had, without the zucchini noodles, and grouper instead of the tofu. Now she knows why it was JUST SO GOOD. For a drink, we shared Pellegrino (it is a two credit/serving bottle), and had a glass of cabernet each. 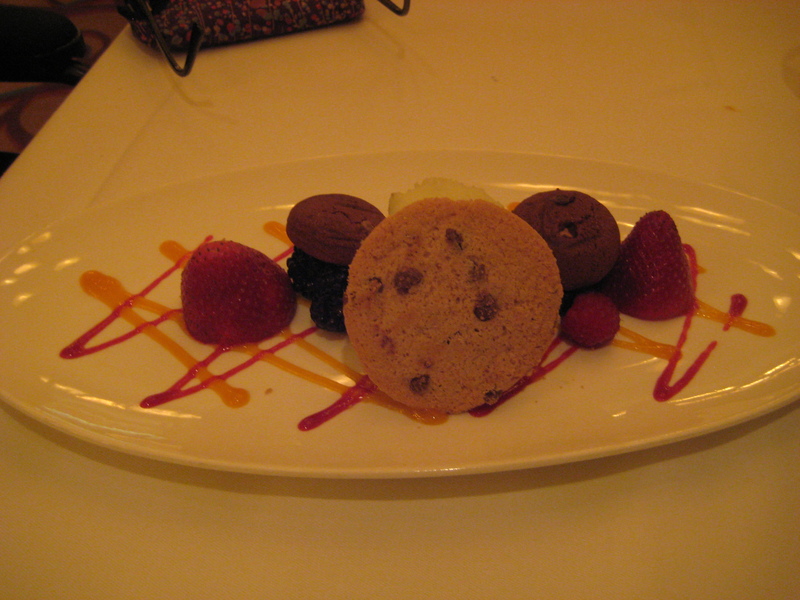 For dessert, I had Enjoy Life chocolate chip cookies on strawberries with Rice Dream (on the right side), berries, and two soft-brownie cookies with Rice Dream inside (like a sandwich). 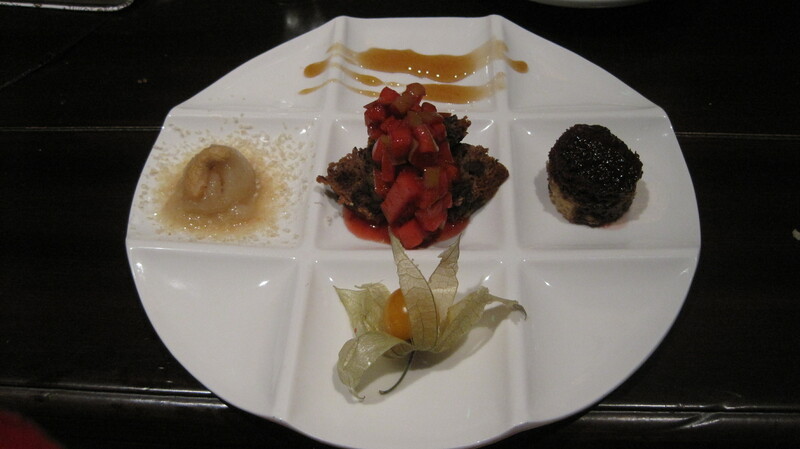 A trio of desserts with thought! 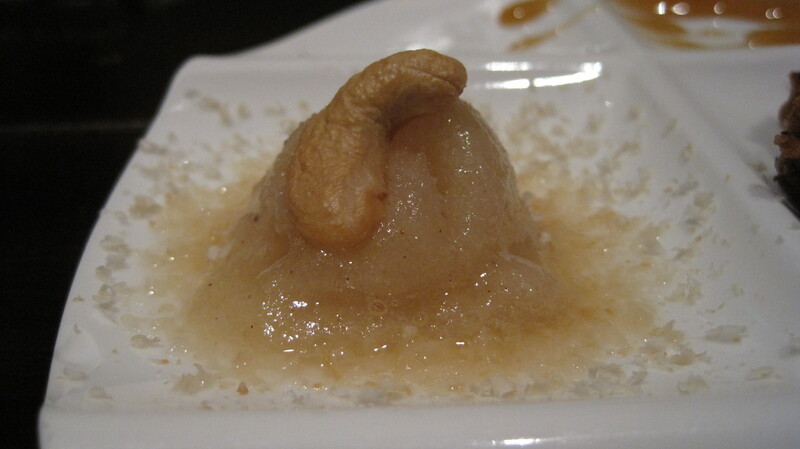 As much as I get a little sick of the allergy desserts, I like when the chefs are inventive–it’s so thoughtful. 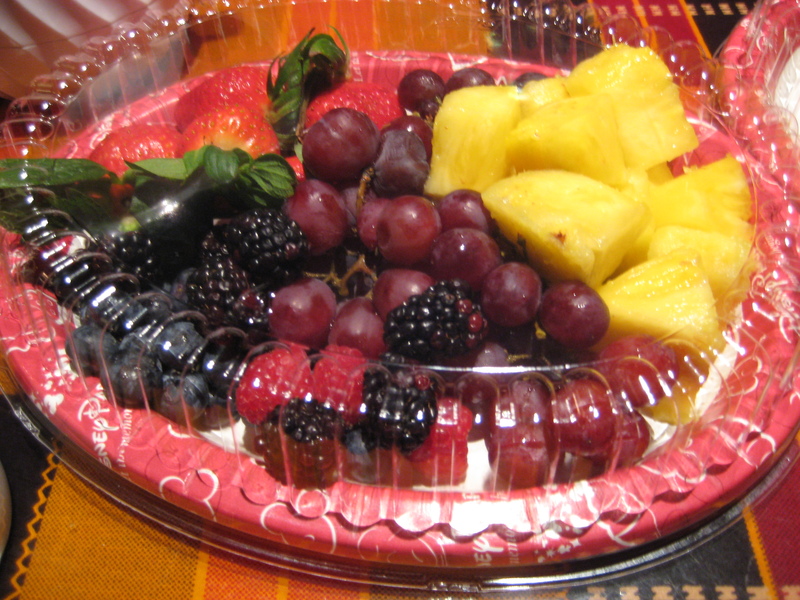 Mom’s was the same but without the Rice Dream–basically a platter of berries and cookies. This was first on my reservation again this year. And this totally is what a Signature restaurant is all about. 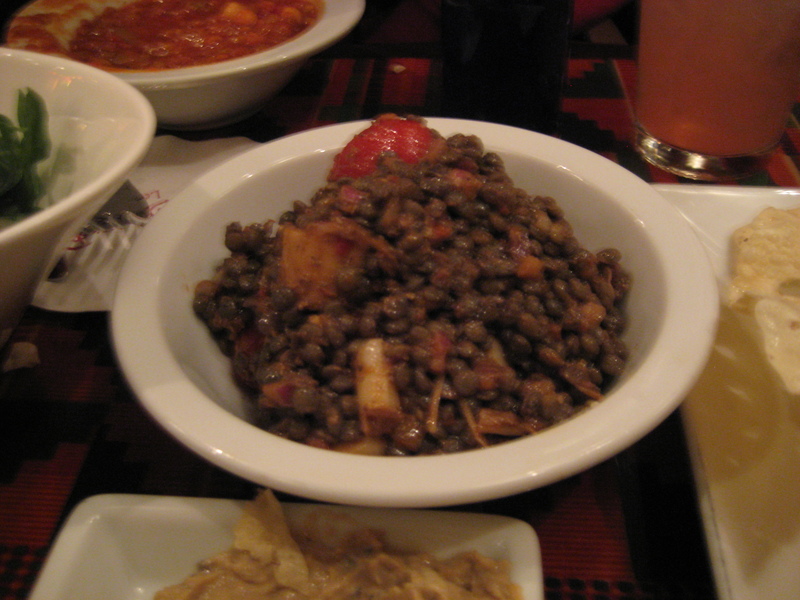 Boma’s dinner buffet doesn’t change much year to year, so although we opted for it again, we’ve decided not to go for it in 2014. 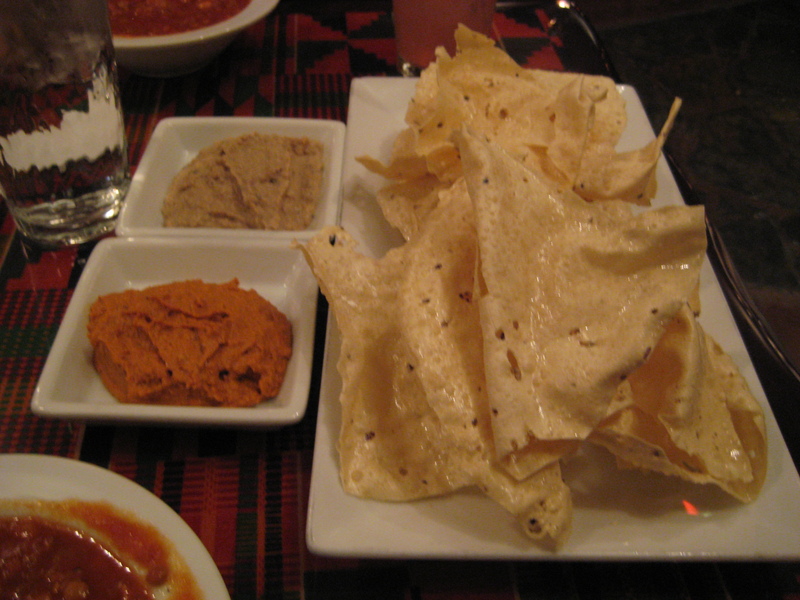 Pappadum (which they deep fry here, and it gets really delicate and greasy–I like the way Jiko and Sanaa do it better). This was alongside sundried tomato hummus and black olive hummus. 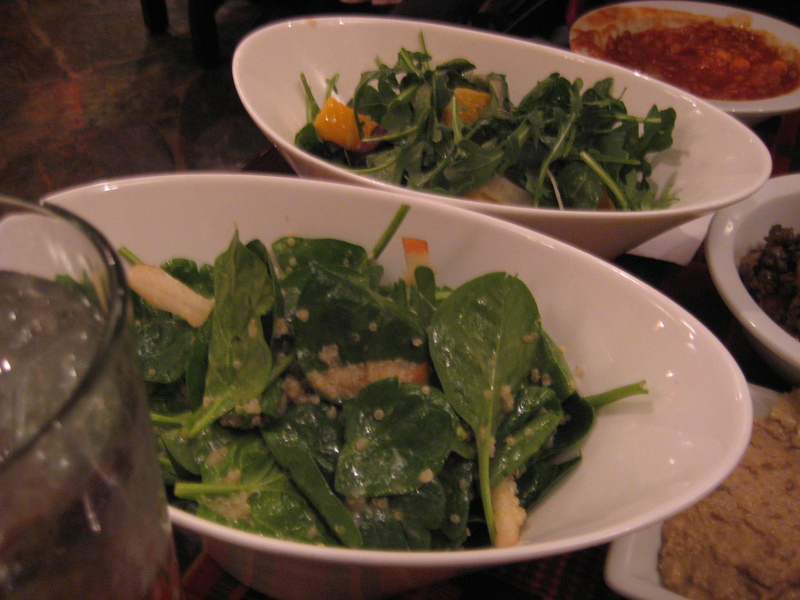 Different salads: Watermelon Rind; Papaya, Avocado, and Grapefruit; Orange, Olive, and Fennel; and Baby Spinach Quinoa. Some of the photos were far too blurry. 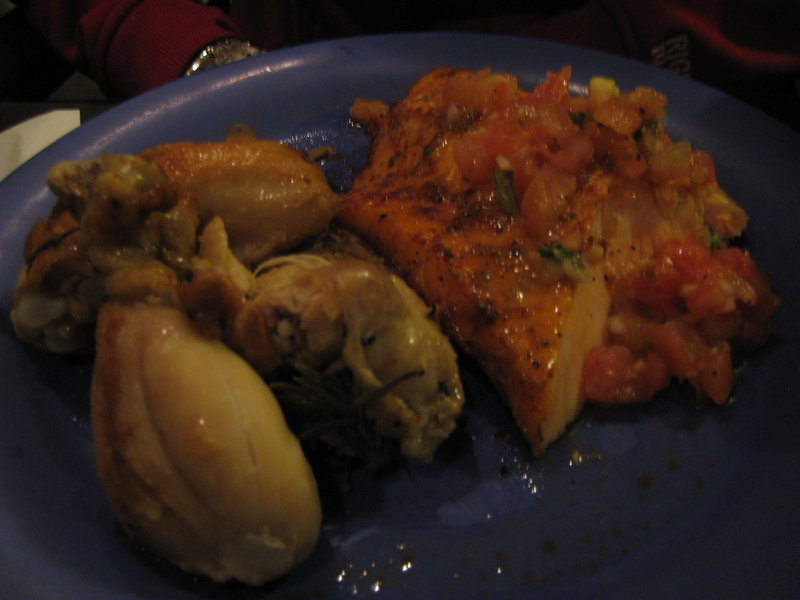 And for the mains, mom’s plate included salmon with harissa, carved strip loin, and roasted chicken. There’s also some chakalaka, roasted vegetables, and geelry’s rice. Those two patties in the top right are some version of a falafel — I had asked in advance if they could make it gluten-free, and instead, I think they went out and bought those falafel burgers. 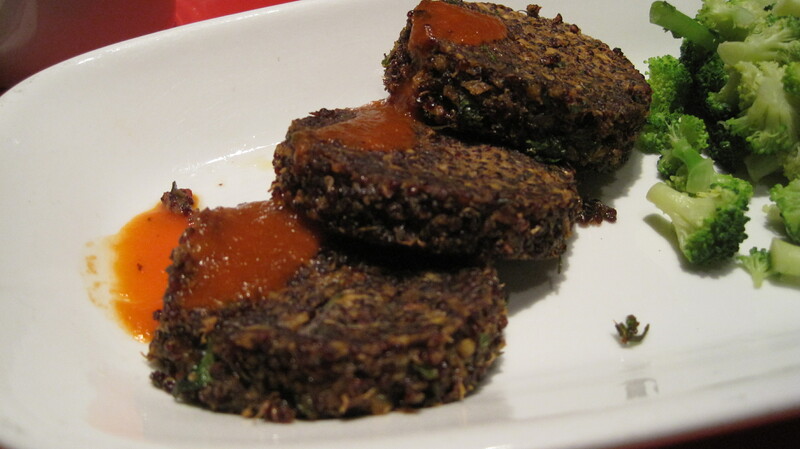 They were tasty, but definitely not falafel! Super filling, though. They gave me five, so I gave two to Mom. 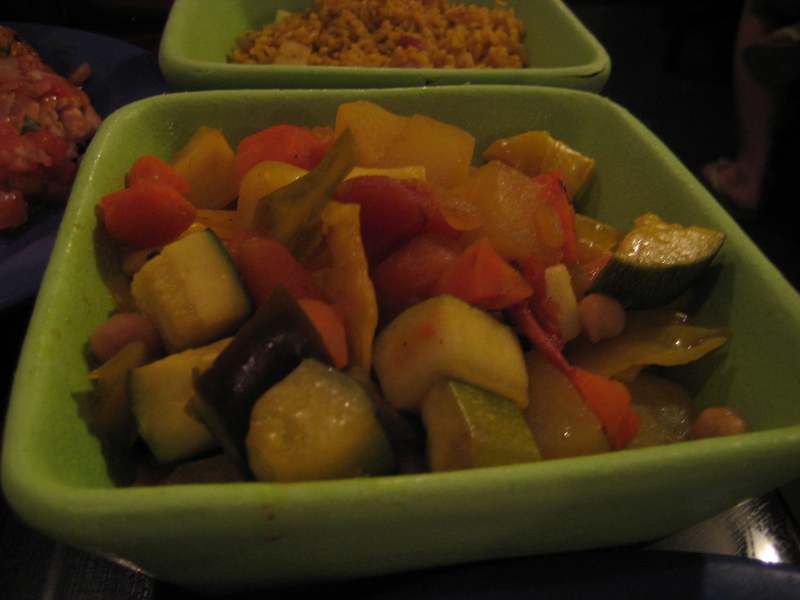 Mine had the falafel, rice, roasted vegetables,and chakalaka. 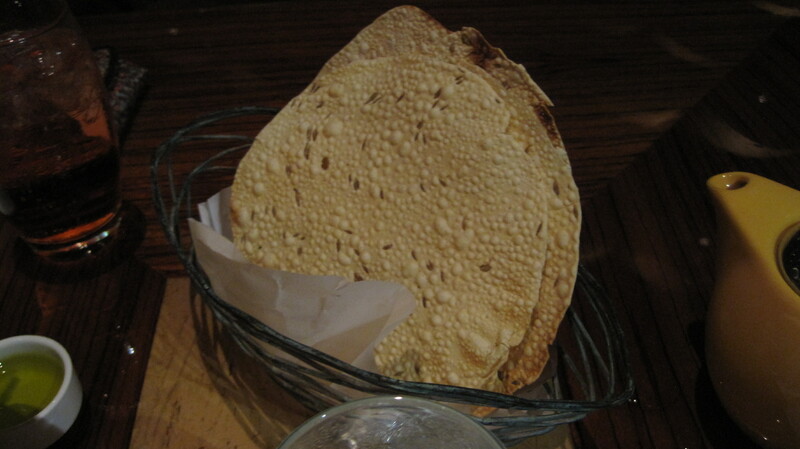 Boma is one of those restaurants that is really good for allergies, inexpensive, and consistent. Because the menu doesn’t seem to change, we’re not going to go for it this year, but I definitely recommend it to folks who like a basic meal with a few twists thrown in, and can cater towards pretty much everyone. 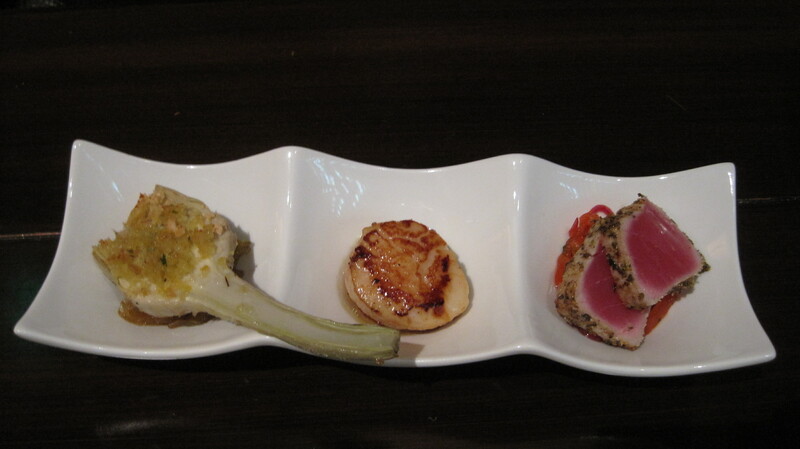 We decided to try out Flying Fish as another signature restaurant despite the very non-vegan menu. I had spoke to Chef Tim on the phone beforehand who was excited about us coming (one of those “We like to be creative”-types), so we decided to keep the reservation. Had they had reservations, we definitely would have changed it up. Anyway, our server was Ellen (lovely woman), and our chef was Tim, but not the same Chef Tim. Ours was “young Tim” (so we later heard), and I think he might have been a little overwhelmed with the combo of allergies on both sides. However, he said that he loved to do things outside the box and if we didn’t mind waiting, he’d serve us a fantastic meal. One reason Mom and I love Table Service is that we love taking our time, so of course we didn’t mind waiting! 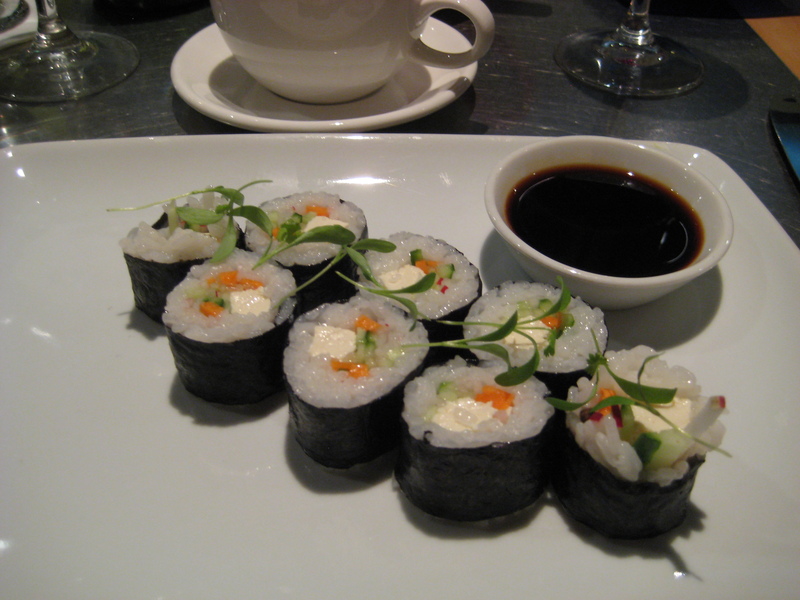 To start, he made me a vegetable sushi roll, with a fresh batch of rice since theirs was not gluten-free. 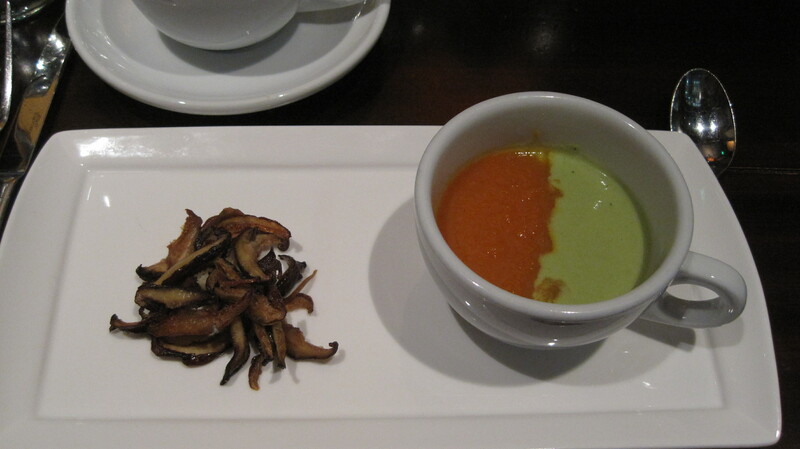 It included silken tofu, avocado, heirloom radish, and young carrot, served with gluten-free tamari for dipping. 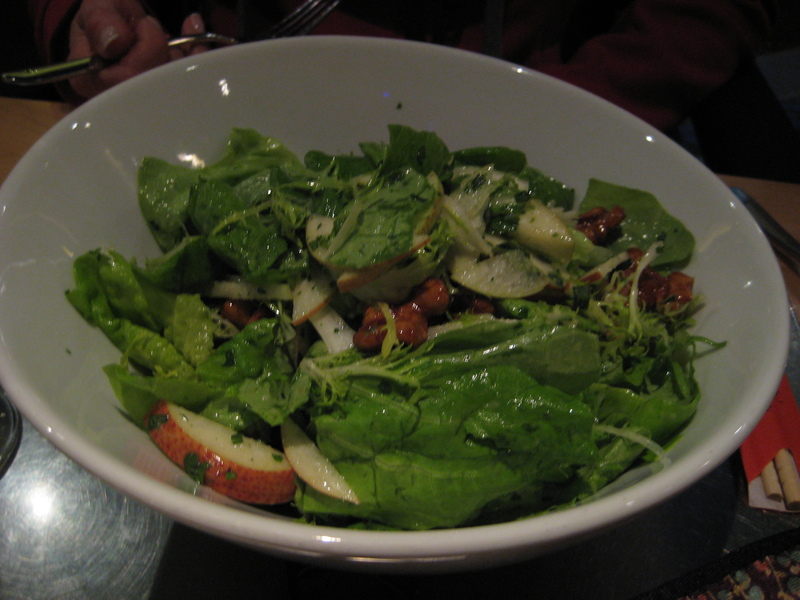 Mom had the Epcot Land Pavilion Sweet Bibb and Red Oak Salad, with treviso, forelle pears, radishes, and candied walnuts. 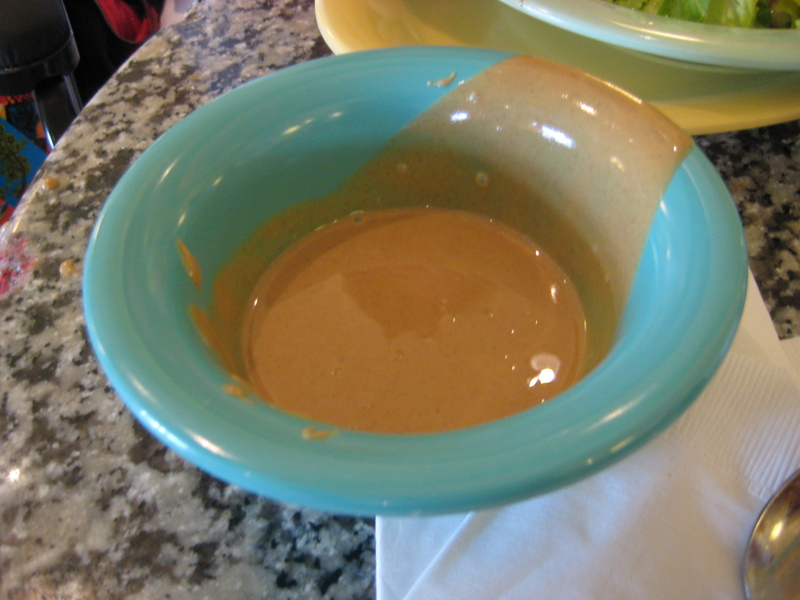 It had a walnut oil vinaigrette. 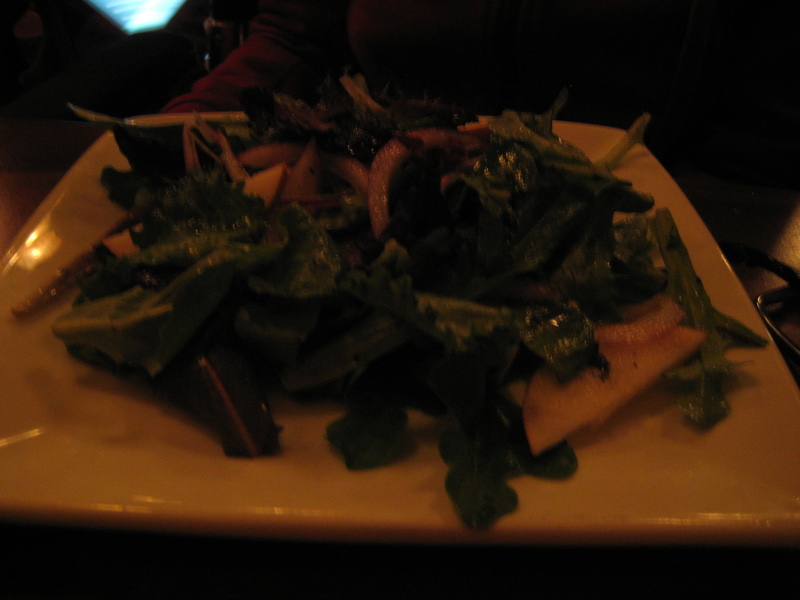 I ate some of the salad, too, and man, this was a really, really good salad. 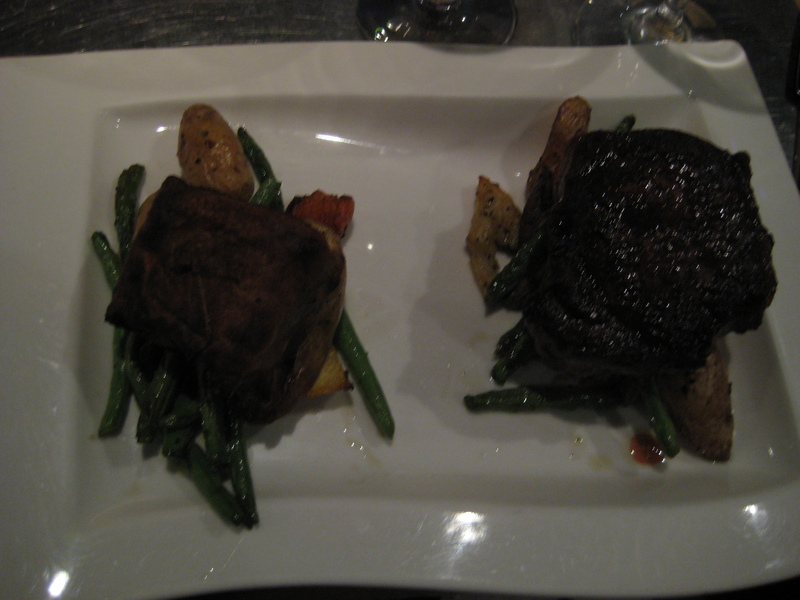 Despite what it appears to be, Mom’s main was the Char-Crusted Angus NY Strip Steak and Potato-Wrapped Snapper. 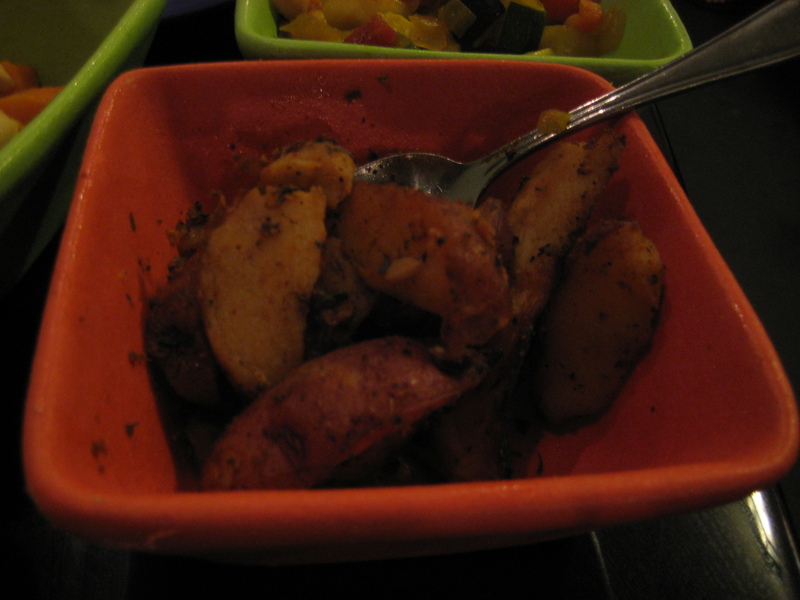 It came with potatoes, green beans, and carrots. “Best steak ever,” she says. He made me a peanut butter and jam “milkshake” with a homemade fresh jam, mixed with raspberry/blackberry sorbet and Pacific rice milk. 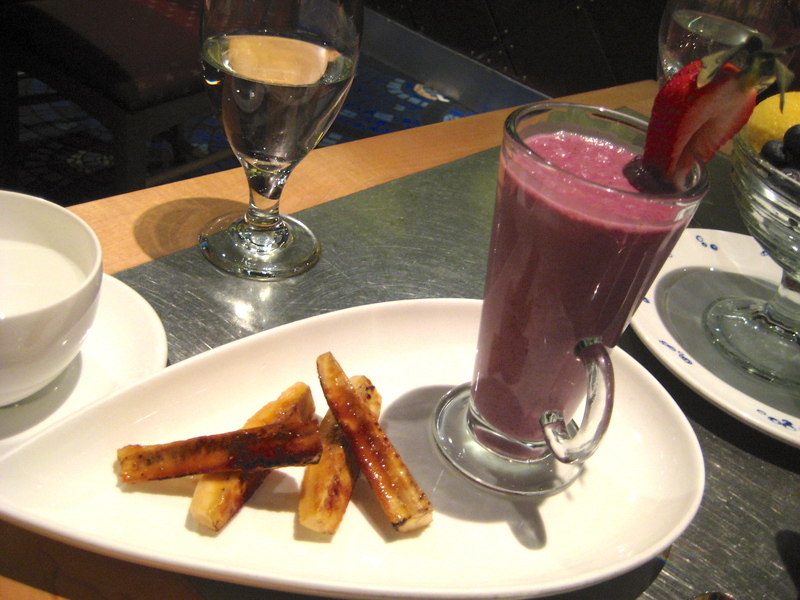 On the side: caramelized bananas, “for dipping” he said. 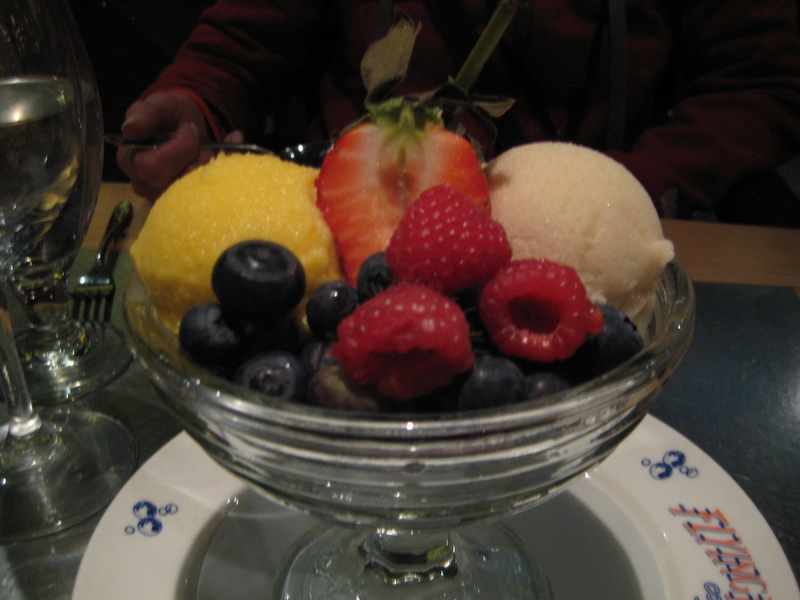 Mom had a trio of sorbets; you can’t see the one in the back, but it was coconut mint, lychee, and spiced berry, with berries. 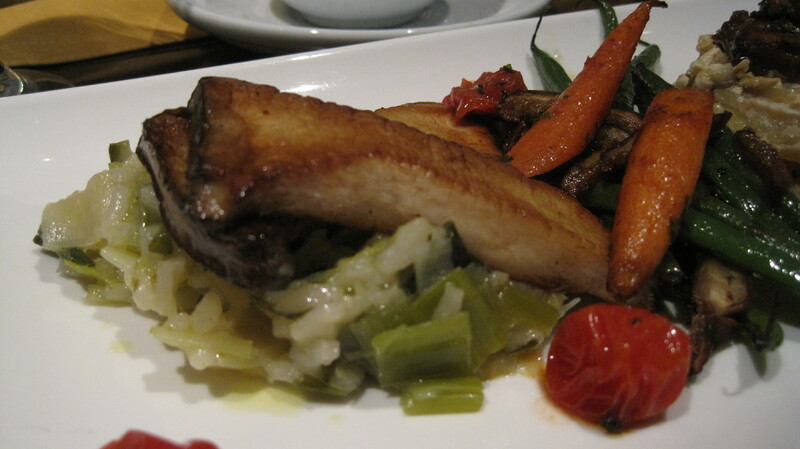 Flying Fish is really fantastic, and definitely worth a signature credit, though maybe not if you are just a vegan. I would pay it out of pocket, if you are, but I would definitely contact them in advance to let them know you’ll be in. Here’s the thing: we wanted a day of just fresh, plain food, and that’s why we opted for Cape May Cafe. That’s what we got… along with the worst chef ever. I called in advance and the chef told me loads of “great things” that they have for vegans, and we talked about cross-contamination for gluten and dairy (because it is a buffet) and so on. 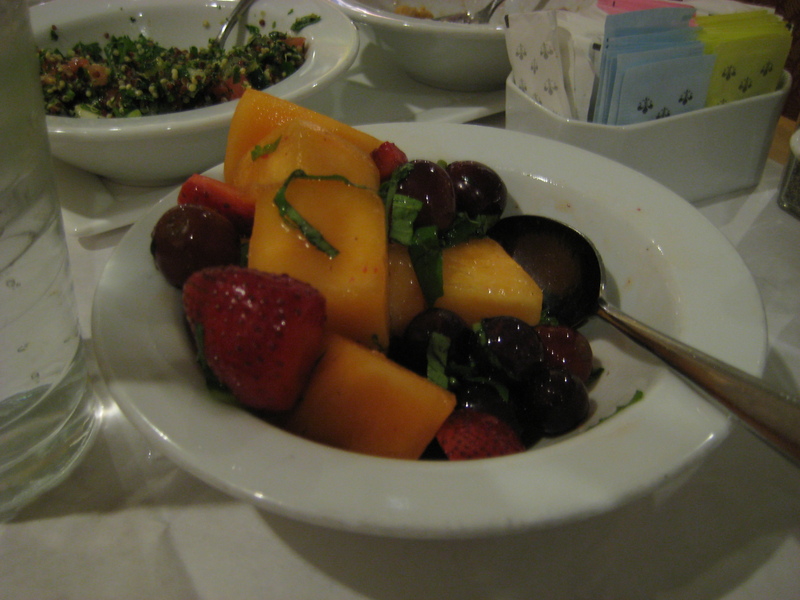 When we got there, our server was Wang (and she was incredible), and our chef was different than who was on the phone. I hesitate to tell you her name because I later learned that it might have been due to some external stress and there had been complaints about her… and I don’t want to say anything too bad. Though I did get glutened here. She brought me around the buffet, pointed out what was safe for Mom and I (both together and separate) but a few red flags went up when she pointed out things that were definitely not safe. She kept saying, “right, I keep forgetting”. 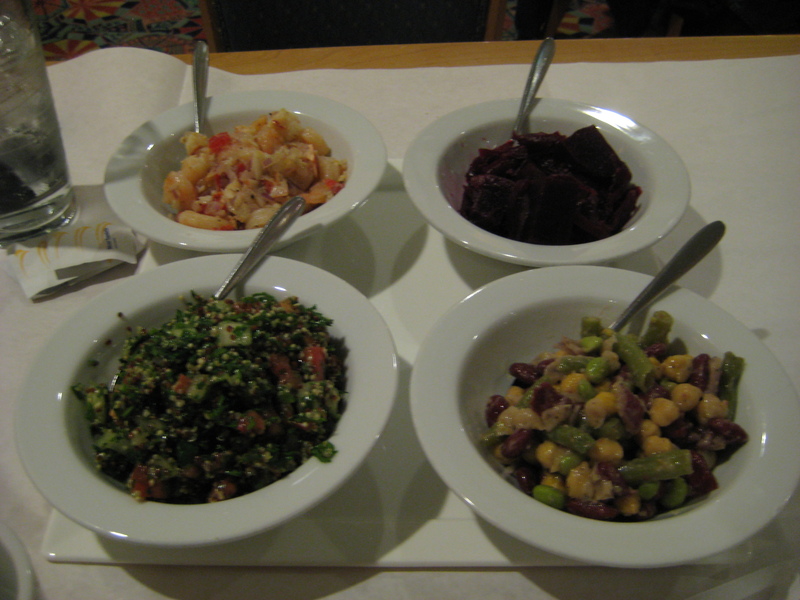 … quinoa taboulleh, four bean salad, marinated beets, seafood salad. I asked her about the things the other chef said (IE Tinkyada pasta and Daiya to make a mac and cheese), and she said, “No, we never carry pasta.” (which I know isn’t true, since all Disney resorts have gluten-free pasta). Had she said that she was really busy or bogged down and couldn’t do it… that would have been fine. 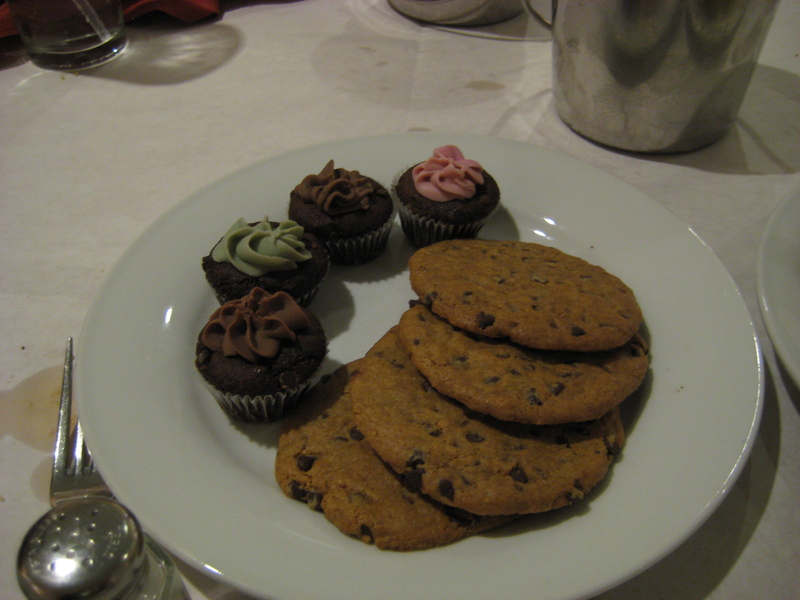 She also took things right from the buffet (after I asked if she was taking them from the back). 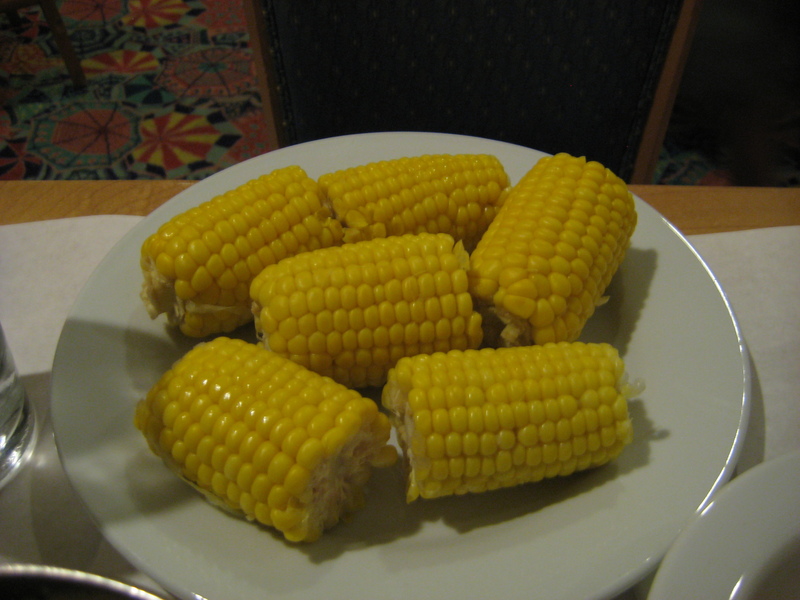 When she brought them to our table and I asked her (the buffet was right beside our table, so I saw her), she rolled her eyes and said, “Fine”. This isn’t all of it — there were a few others things. And right at the beginning of the meal, I was glutened, somehow. The food was good and our server was amazing, and in fact, I wouldn’t NOT go back. But I talked to two chefs after this about the situation–to see what the deal was–and they filled me in on some details, so I don’t really want to say anything bad. But if she was ever my chef again, I would leave the restaurant because I certainly wouldn’t feel safe. Tusker House is one we went to our first year, but I got glutened (I think) and didn’t want to go back last year. I felt confident after a two year turn around (and seeing menu changes, and reading a review with a chef change), so we headed there this year again for dinner. This, again, is a buffet, and the chef led me through the buffet and pointed out what we could eat. You could tell he was exhausted, and he told us he had over 100 requests that day. 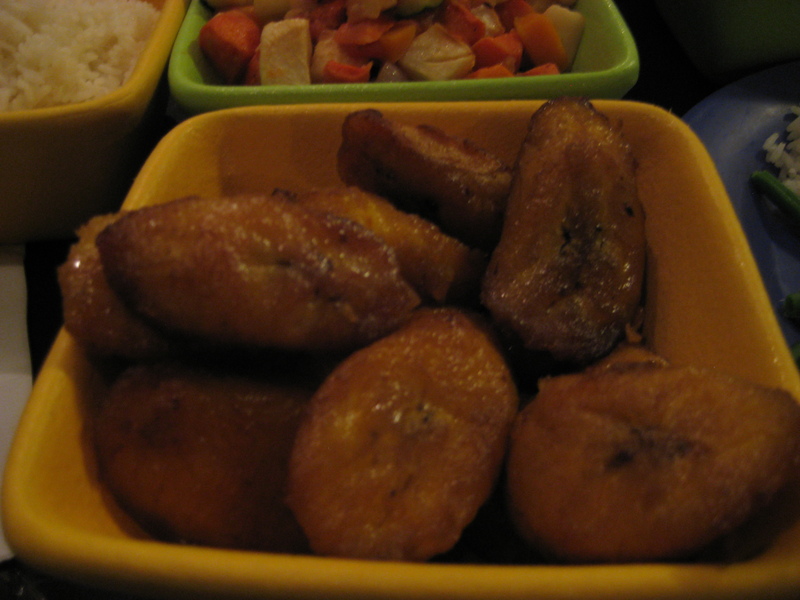 … caramelized plantains, that I could eat all day (they had soy, FYI). We also had some chutneys and hummus. 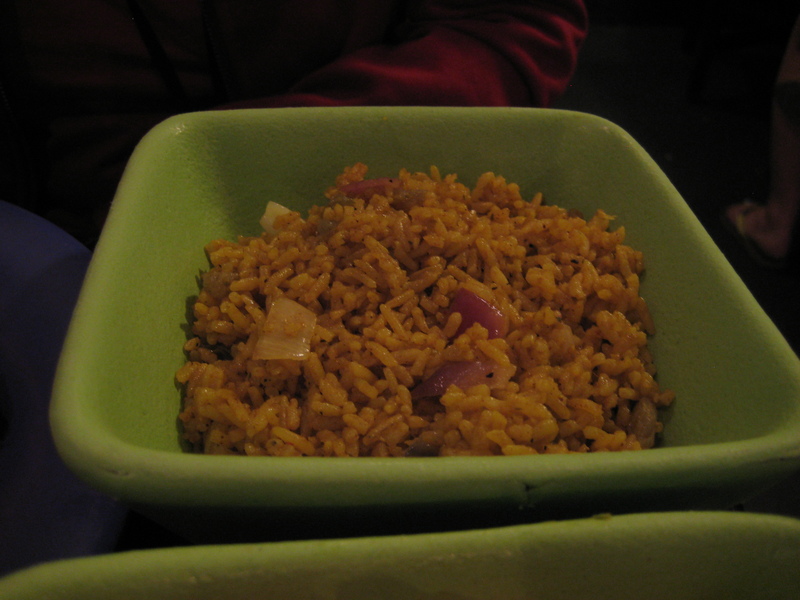 Tusker House flavorful and a simple dinner option if you’re at Animal Kingdom. You could probably get away with not having to speak to the chef beforehand, since they’re well-versed in food allergies. 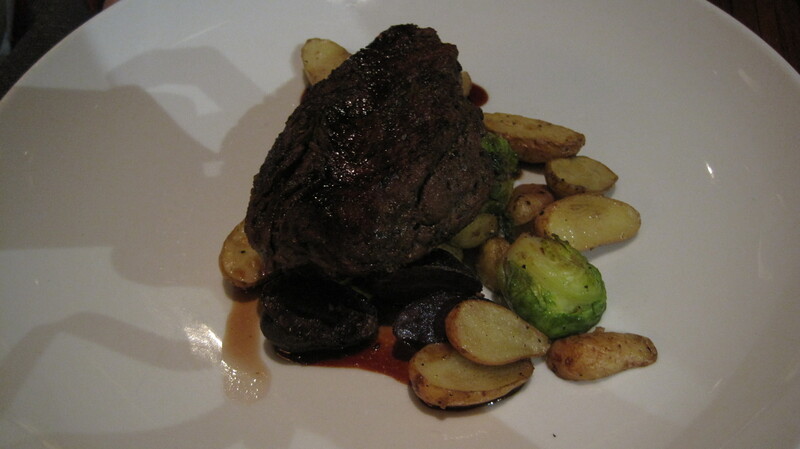 We ended at Ohana this trip–a restaurant we were hearing good things about but never tried. I’m glad we did! Chef Tony, who I spoke to on the phone, truly did deliver! However, he wasn’t our chef–Chef Boone was–but they tagteamed our table and served us an awesome meal. Our server was Heather. 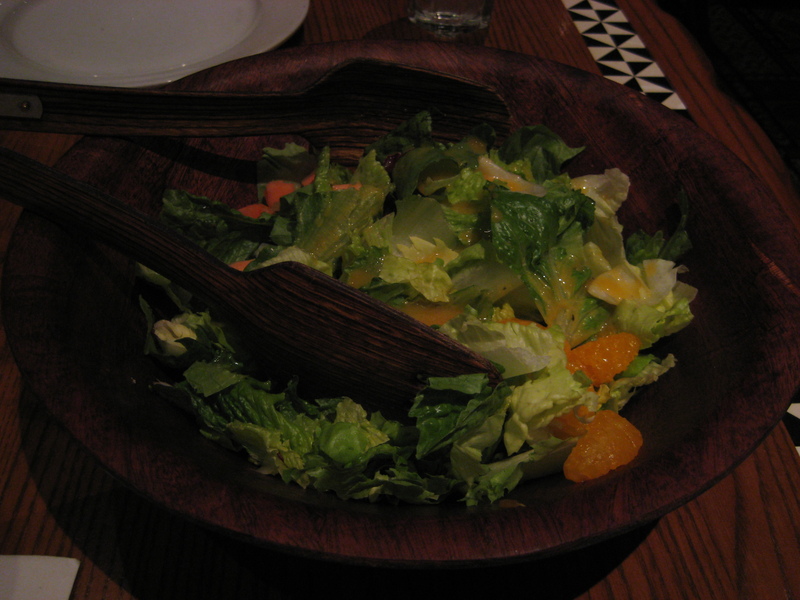 We started with their green salad, that has a passionfruit vinaigrette, papaya, mandarins, romaine, and radicchio. 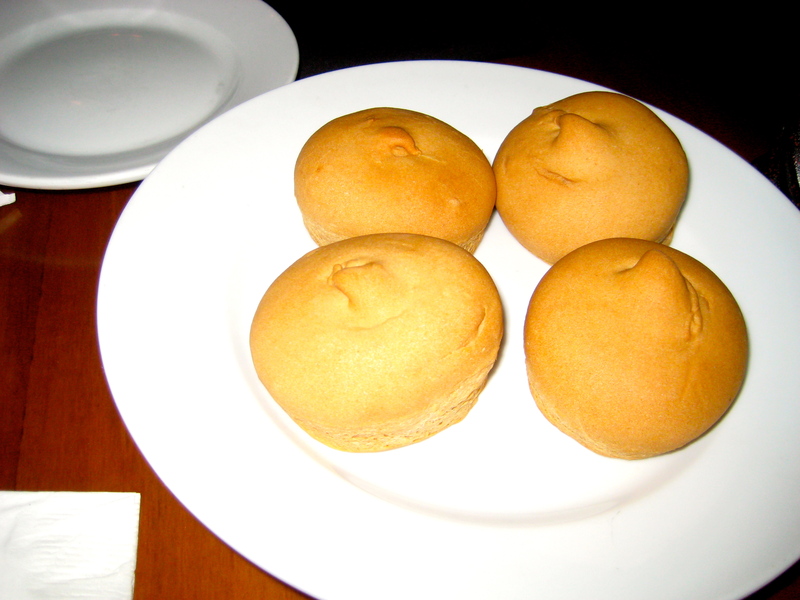 GNI rolls warmed on the side. 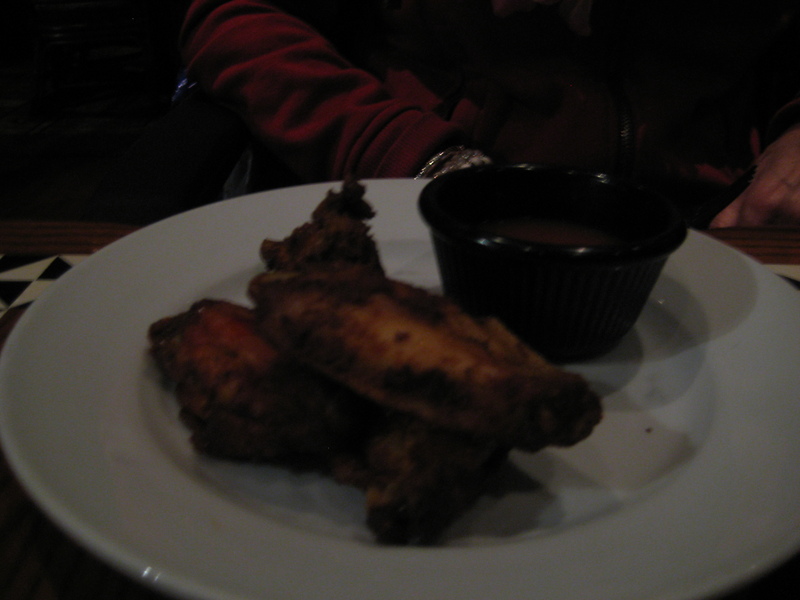 Mom’s appetizer included the chicken wings, which were fine to eat. 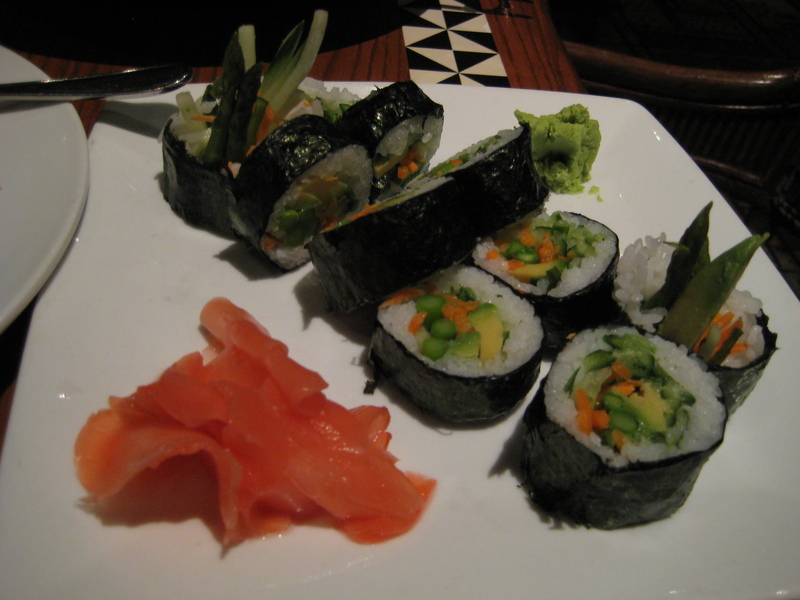 They surprised me with a really amazing sushi rolls with loads of fresh vegetables. 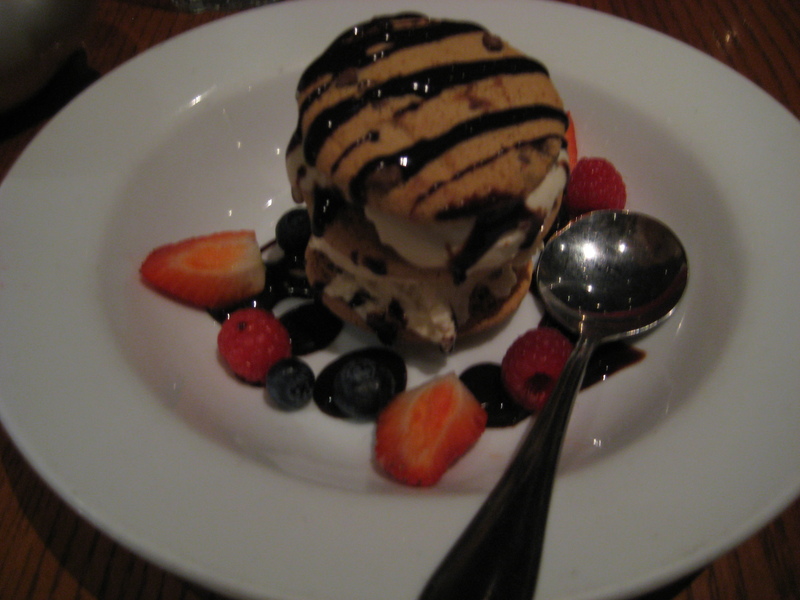 I could have eaten five of these–it was just that good. 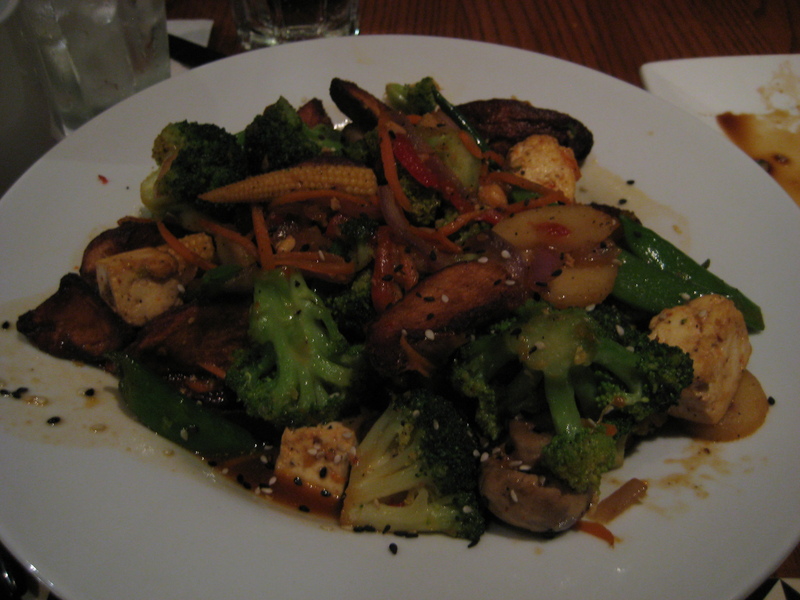 My mian dish included tofu, broccoli, corn, potatoes, chestnuts, snowpeas, carrots, onion, black sesame seeds, in a really rich teriyaki sauce. It tasted like the same sauce used here. A little too rich for me and, in later visits, I asked for it without it. I like salty rather than sticky/salty/sweet on stirfries. 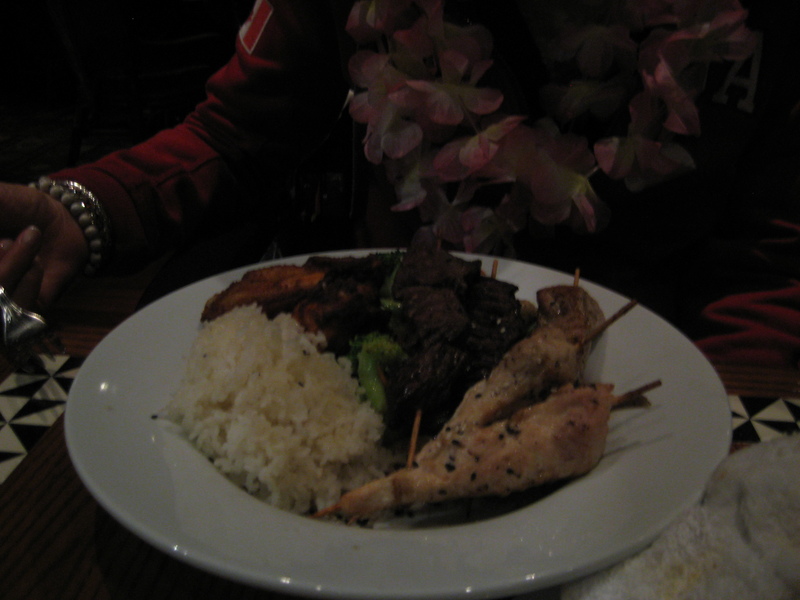 Mom’s dish had beef and chicken skewers, with a few more chicken wings. She could have had shrimp, too, but decided against it. 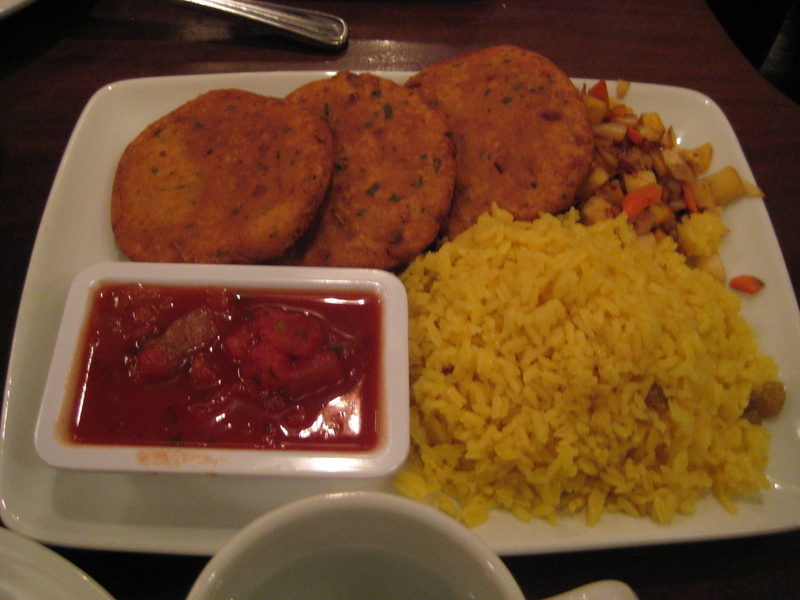 It was served with the same vegetables, minus the tofu, and rice on the side. 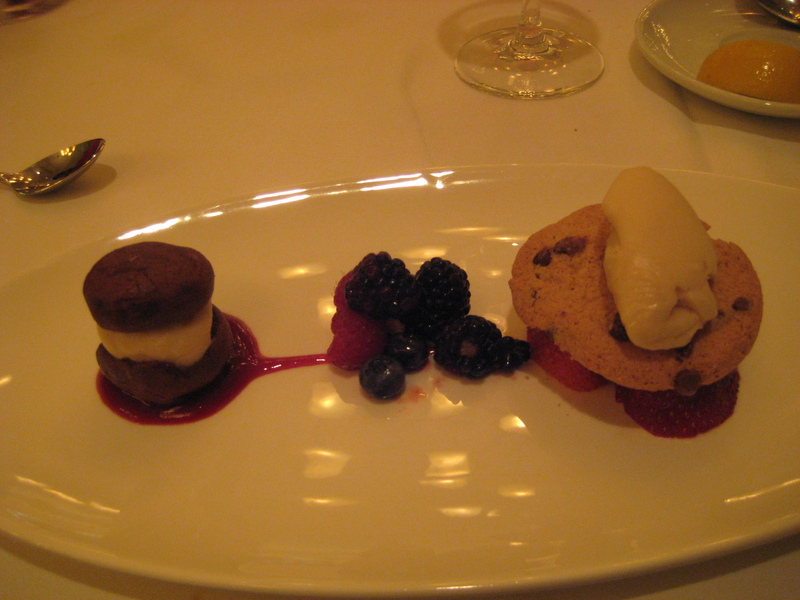 Dessert for me included vanilla Tofutti with three Enjoy Life crunchy chocolate chip cookies and berries. 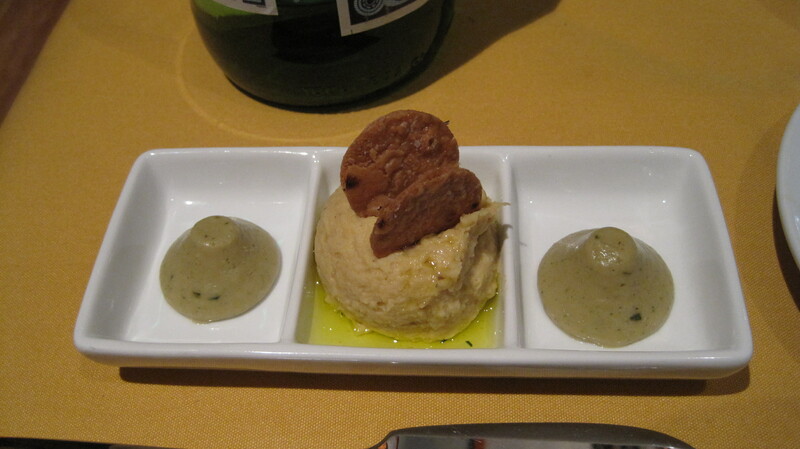 I always question Tofutti’s safety and, frankly, don’t like it at all, but I was stuffed anyway. 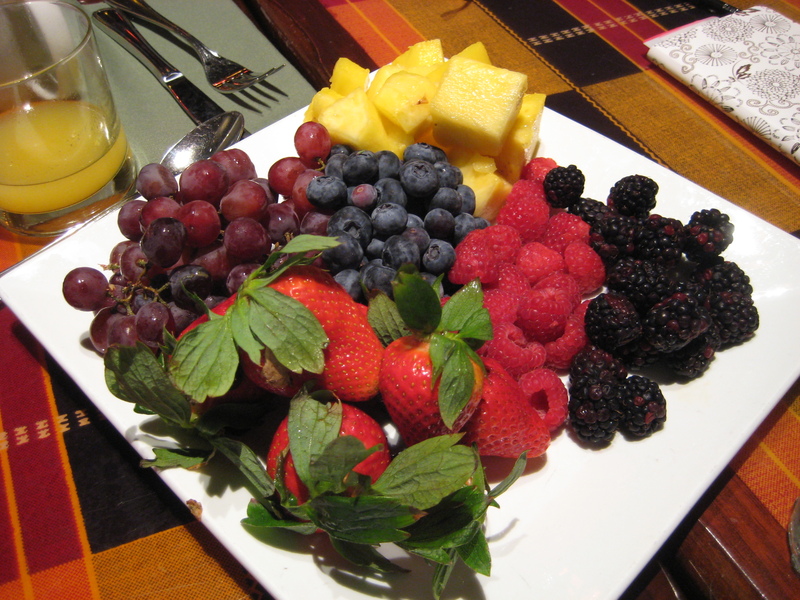 I ate a bit of the cookies and berries and left the rest. 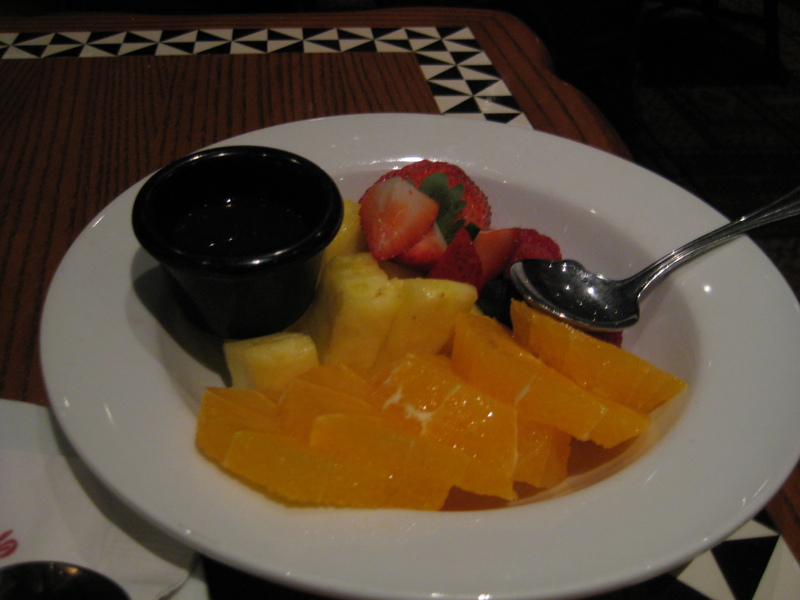 Mom couldn’t have the ice cream, of course, and had lots of fresh fruit with chocolate sauce. Thanks for all your information here! I love Disney World and have also had great success overall in finding vegan food. What is it about Tofutti that makes you question its safety? Tofutti’s website used to have the disclaimer (the one we often we) that says, “well, we are gluten-free, but we don’t certify anything so we can’t guarantee” et cetera. Now they state that they are basically gluten-free (but again, aren’t certified). That being said, I don’t feel well after the few times I’ve had it, and I think it really is, well, not very tasty, anyway. I know I am in the minority but, for the foods I eat that are packaged, only eating certified items. Thank you, Laurie! I like some Tofutti products. I’m a vegan with soy sensitivities, and I don’t have problems with gluten. Do you have any other questions? I am here to help! I appreciate your help. Thanks! I don’t have any other questions for now, but I’m sure I will before my next trip to Disney World.